Friday, January 14: In the morning, I snuggle under the heavy duvet, warding off the cold air. 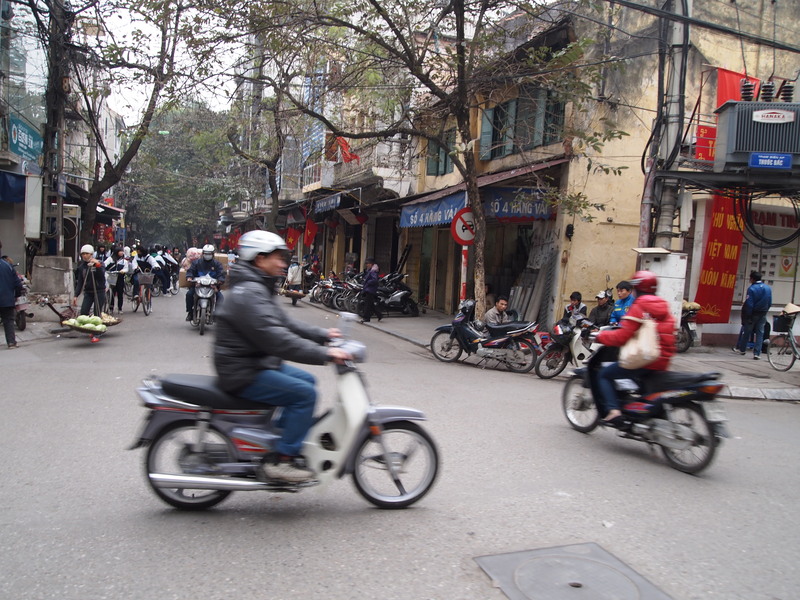 I debate: should I sleep in and have a leisurely first day in Hanoi or should I get up and do the Hanoi city tour? 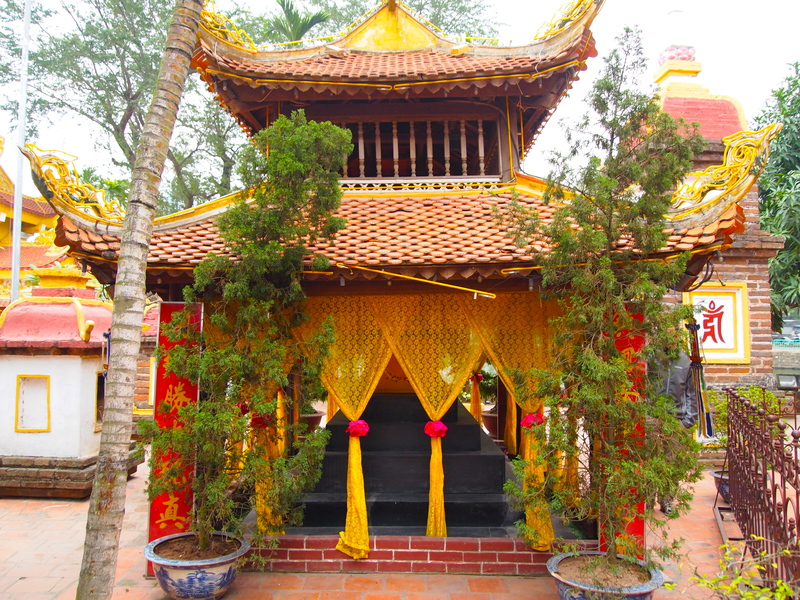 Since I have such a short time in Vietnam, I think I should get up and go; I’ve found that small locally-run tours are great for getting an overview of a city. Plus, after all my travels locally in Korea, I know that the logistics of getting from one place to another using public transportation can be a challenge, wasting much time and money. So, despite the fact that I’m totally wiped out from yesterday’s ordeal, I get up and take a lukewarm bath in the only bathtub I will see on this trip. In the breakfast room, with a TV blaring episodes of Tom & Jerry , I have a nondescript omelet, orange juice, bananas and papaya strips, and coffee. Though I try to communicate that I want Pho, or Vietnamese noodle soup, somehow the omelet comes unbidden to my table. I eat it. 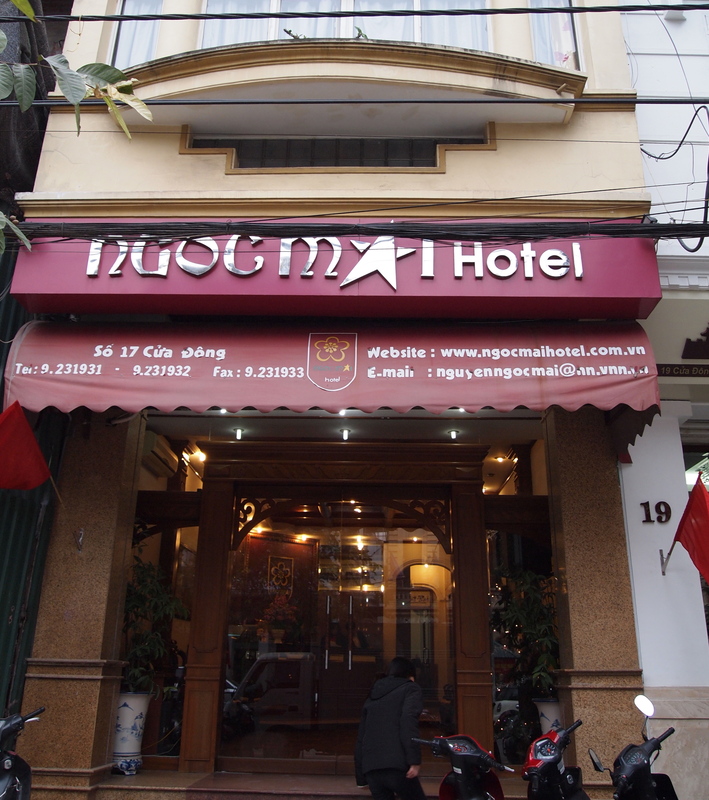 On the way out, I tell the friendly English-speaking Vietnamese lady at the front desk that my heat wasn’t working last night. She, very concerned, promises to have someone look at it. I hop in the tour van at 8:30. 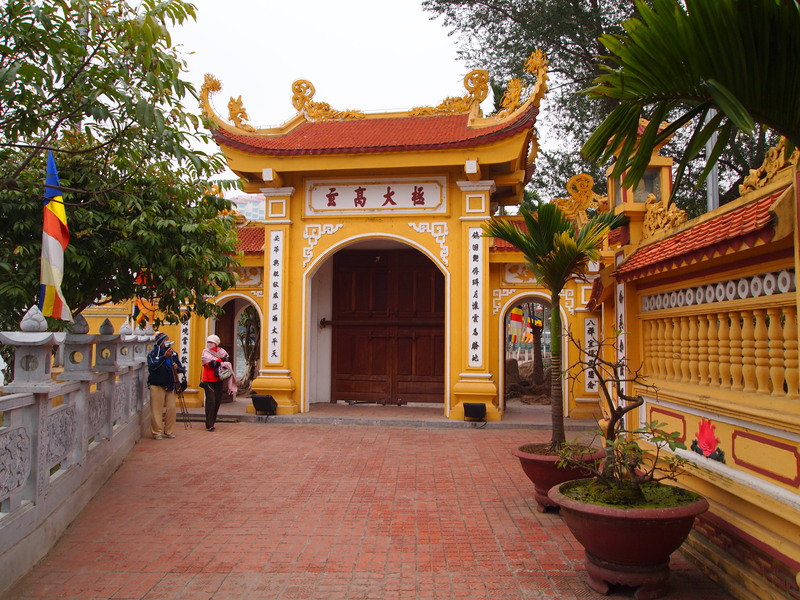 Our guide Thanh tells us that in 1010 the capital was moved by the emperor of the Ly Dynasty to Hanoi. 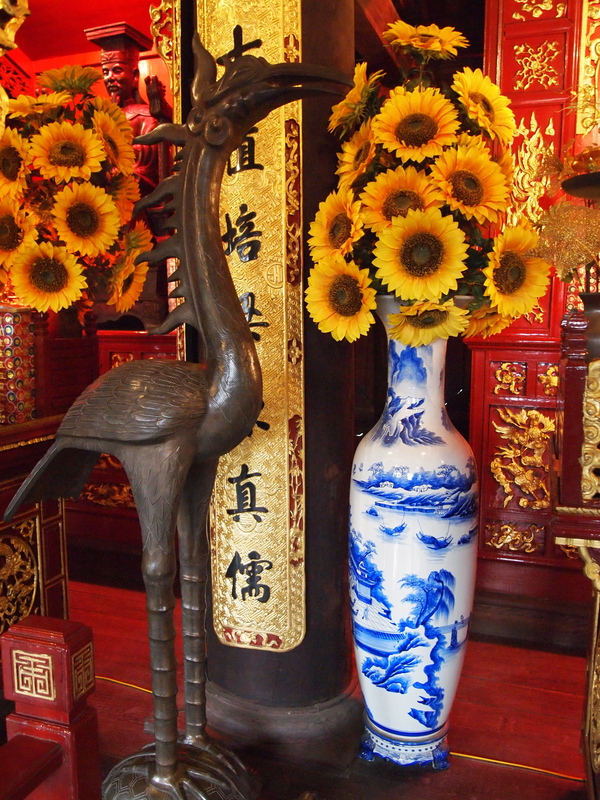 At that time he named it Thăng Long, which means “ascending dragon,” because he saw a yellow cloud in the blue sky and thought it looked like an ascending dragon. 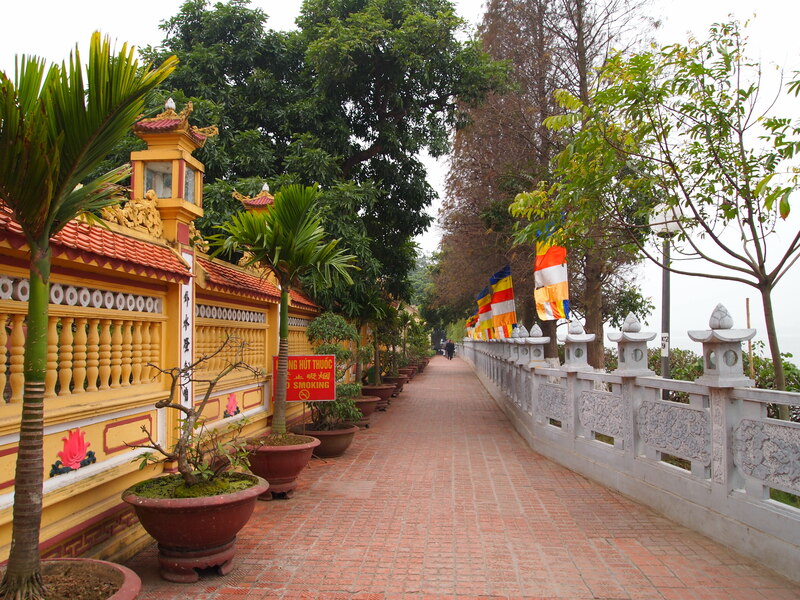 In the 15th century, the name was changed to “Hà Noi” , which means between rivers or inside river. 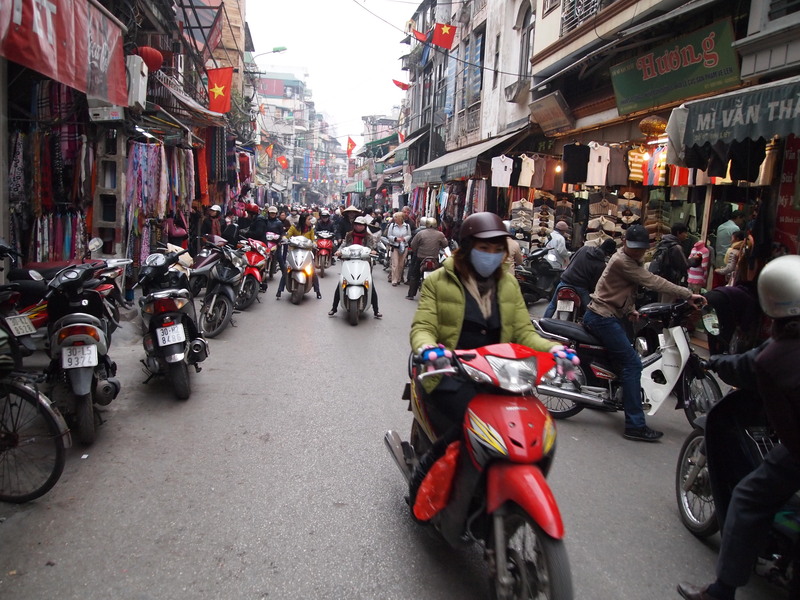 He says Hanoi has about 6 1/2 million people and about 4 million motorbikes. 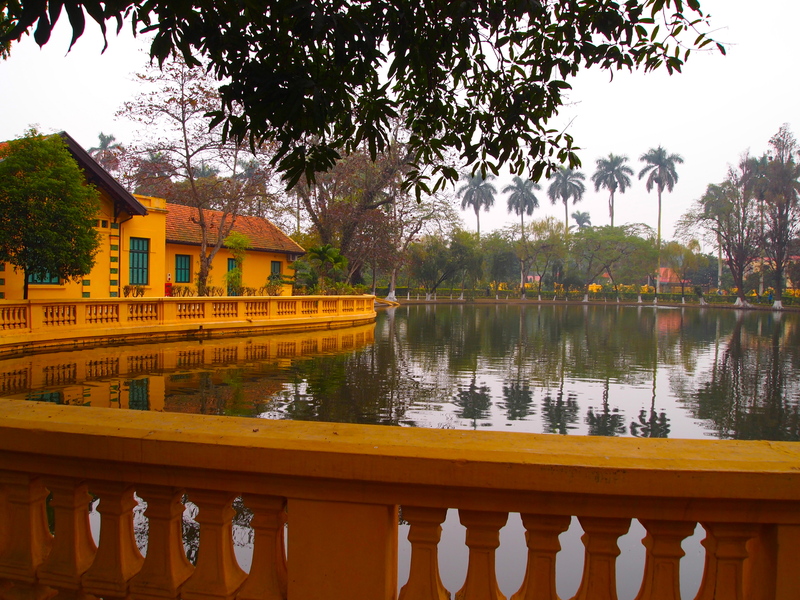 Hanoi is of course the capital of Vietnam and its second largest city. 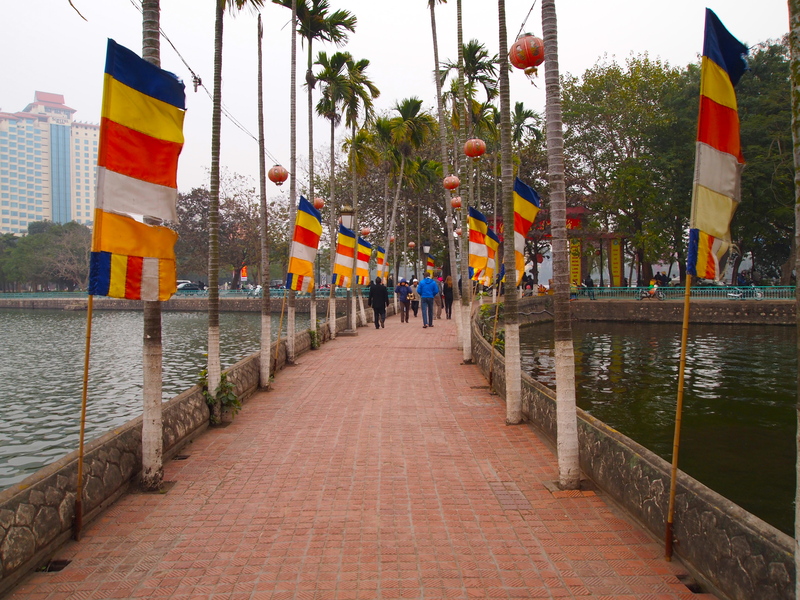 We head first off to West Lake, the largest lake in Hanoi. 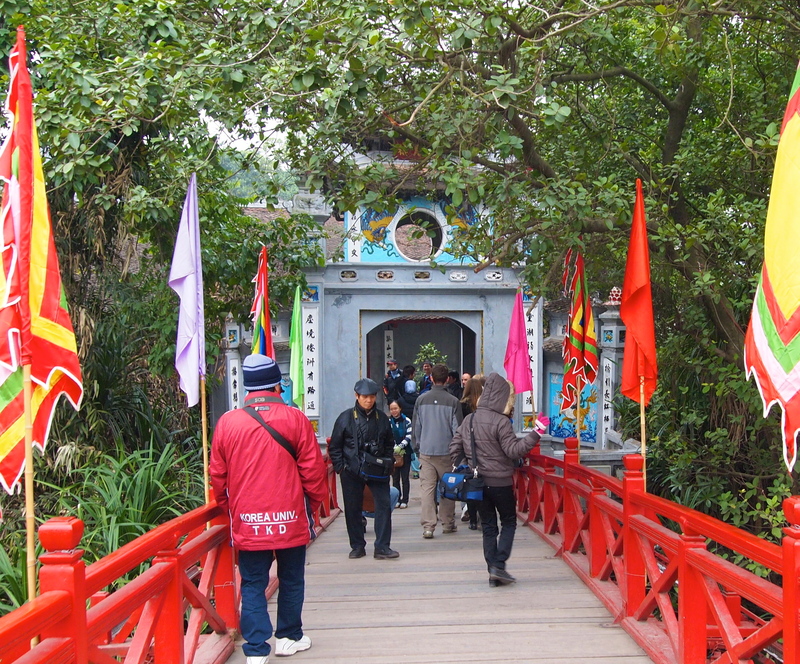 Many people flock here to visit the plethora of temples. In transit, I introduce myself to everyone in the van. 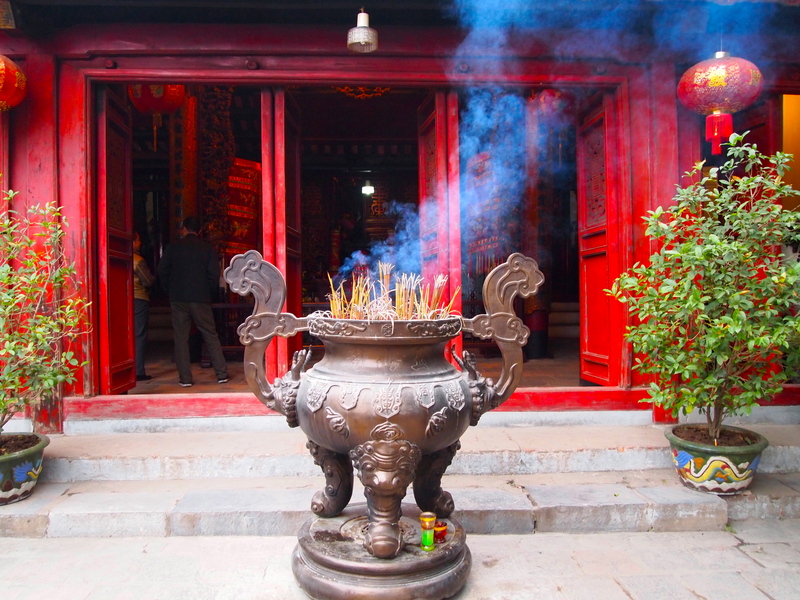 Andrew from Melbourne is a young medical student who is traveling all over southeast Asia. Roz and Sway, her Burmese husband, are from Sydney. She does temp work and he teaches Japanese. There’s a couple from Malaysia whose names I don’t catch, a young Korean medical student named Il Ho, a 32-year-old Korean woman, a couple from Norway, Kathy and Joe from Ireland, Peruvian Gonzales who transports animals to zoos worldwide, and a Finnish guy who doesn’t like Hanoi much because “it’s too cold” and he only has a pair of flip-flops for shoes. 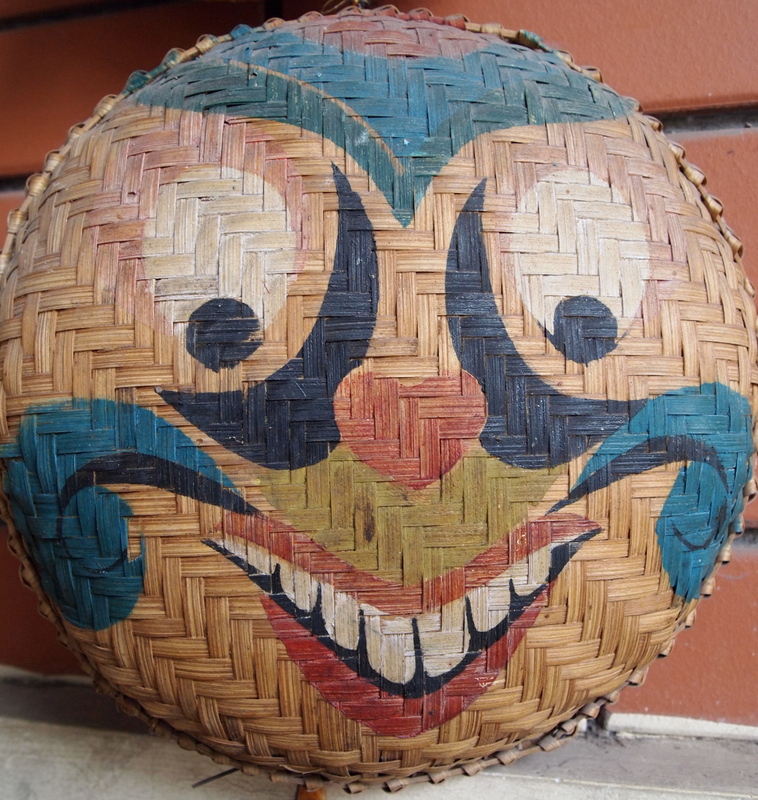 This unlikely group of vagabonds is garrulous and fun and we have quite a grand time all day. 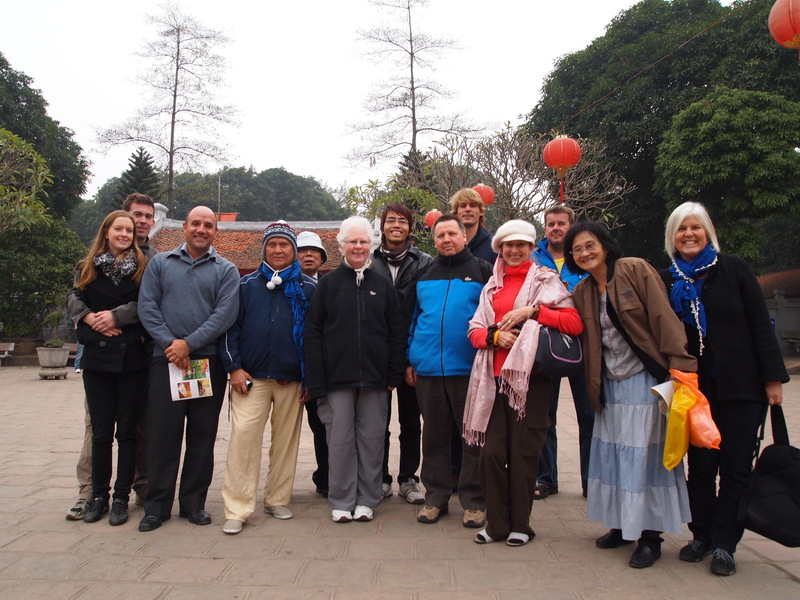 We look like a bunch of homeless people as we have all come dressed for summer and so have thrown together a bunch of mismatched layers to keep warm in the unexpectedly cold Hanoi. 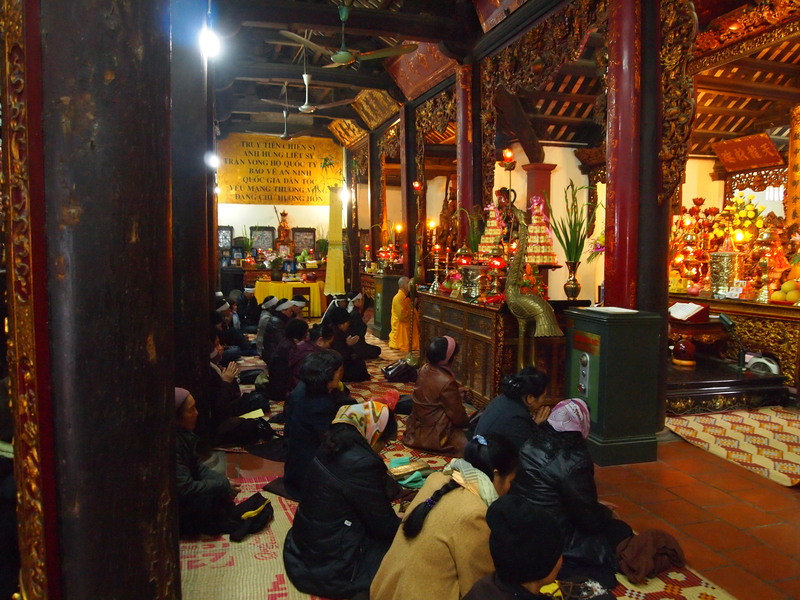 I’m happy to find other misguided souls who so wrongly predicted the weather in northern Vietnam. 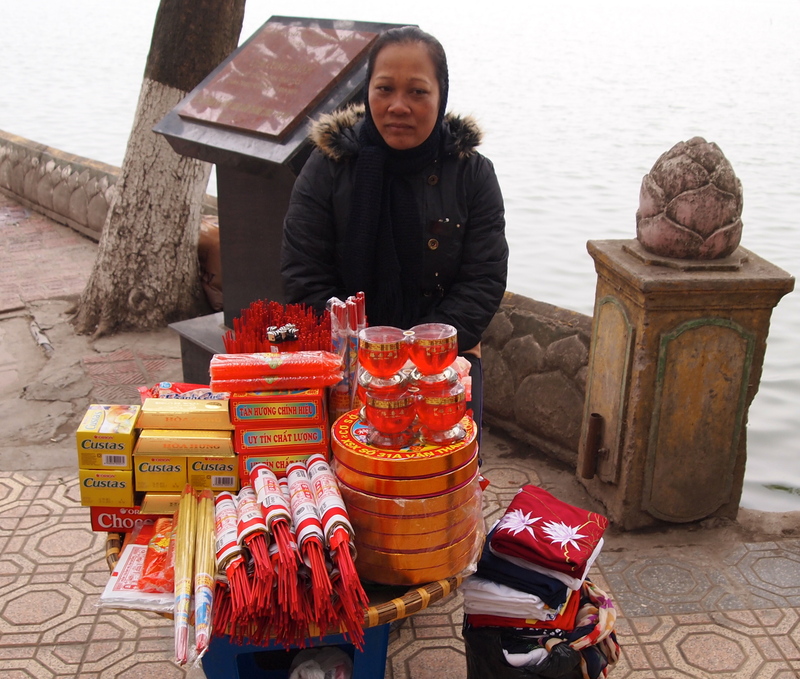 At our West Lake stop, we are accosted by Vietnamese ladies wearing conical hats. 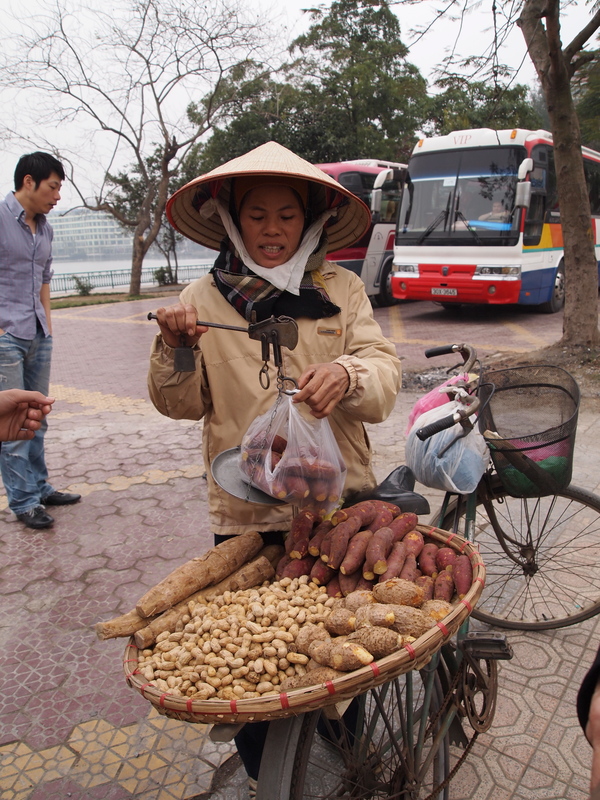 Some are selling yams, peanuts and ginger root out of baskets attached to their bicycles and others are carrying heavy poles over their shoulders, with baskets of bananas & pineapples at each end. One of them makes a pitch to me for bananas; I don’t want any but she persists. She transfers her pole to my shoulder and I’m shocked by how heavy it is. Especially for such a diminutive lady. Gonzales kindly snaps a picture of me, the “Americanese.” The vendor takes the opportunity while I hold her pole to pull her blouse off her shoulder; she shows me a deep scar on her shoulder from carrying the weight. I reach out to touch it, feeling sympathetic, and then she goes in for the kill. She holds a small bunch of five tiny bananas in my face. How much? I ask. She says 50,000 dong. I am shocked, thinking this sounds like a huge amount, but then I remember that 20,000 dong equals about $1. 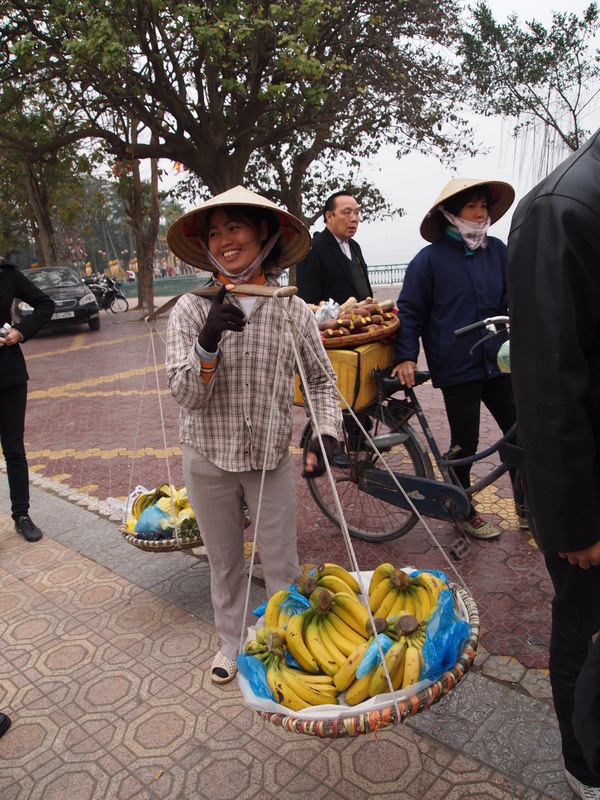 Feeling sympathetic about her hard life, I give her the 50,000 dong, $2.50, for the privilege of carrying around a bunch of bananas I neither need nor want for the rest of the day. 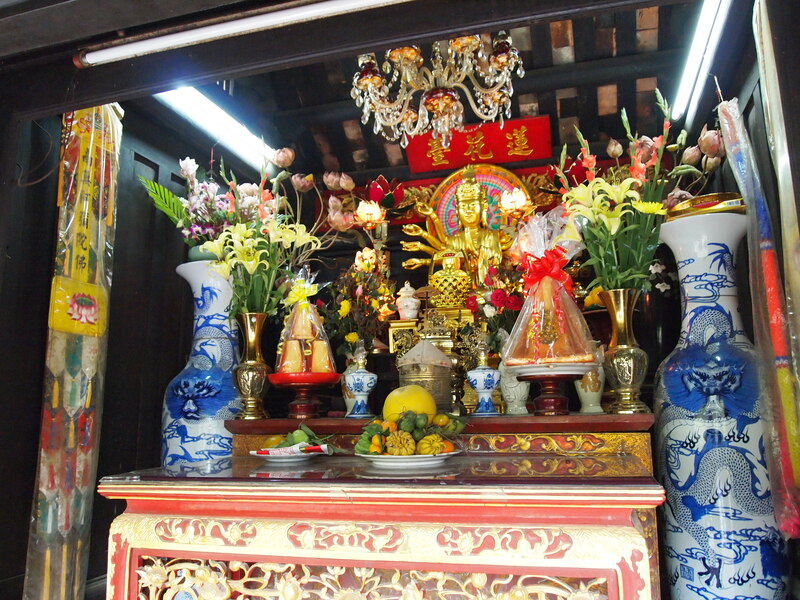 As we walk to the Tran Quoc Pagoda, I mention to several others that I think I just got scammed, paying too much for the small bunch of bananas. A sympathy purchase. The rest of the day, my bananas become an ongoing joke among the group. “Cathy, how are those bananas? If you want bananas, just see Cathy! 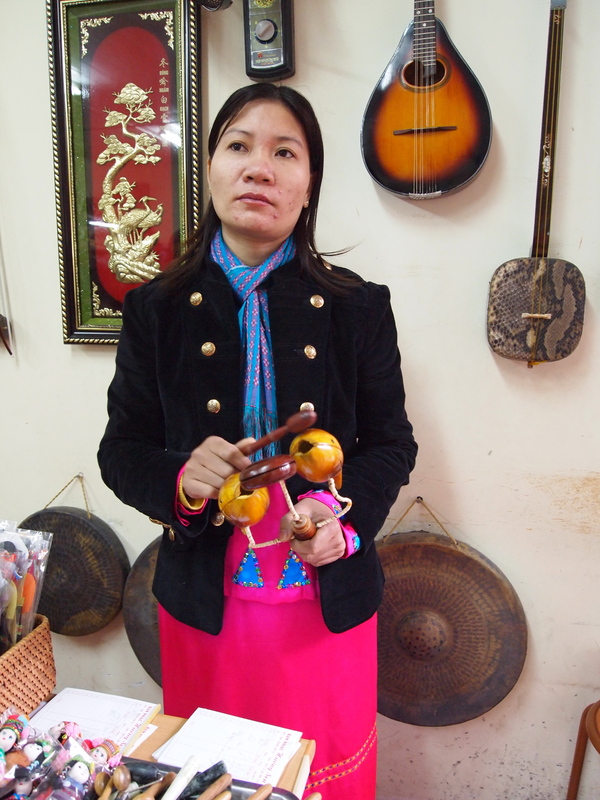 When are you going to open your worldwide export business?” It’s like I’ve become one of the vendor ladies. 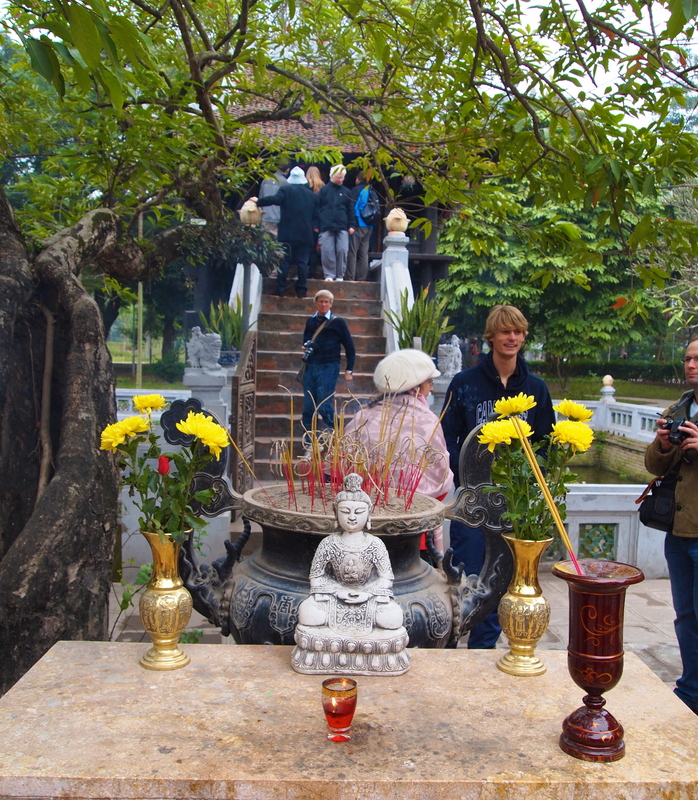 Ridiculously, this becomes the story of my entire trip in both Vietnam and Cambodia. Poverty runs rampant in these countries and it’s unbelievable how little they ask for goods and services that we would pay much more for in the U.S. Somehow I feel guilty giving them only their asking price and so usually throw in a few more dollars. 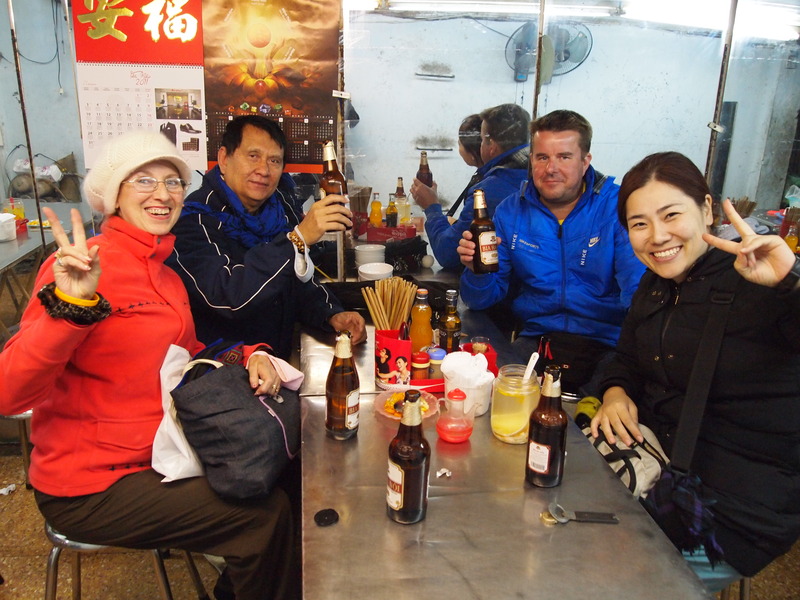 Sometimes I think I’m stupid for doing such a thing; other foreigners seem to be happily enjoying the cheap prices. Other times I feel like it’s money they need more than I do. Although when I really think about it, I work hard for my money and I don’t make a lot either. It’s not like I’m some multimillionaire philanthropist who can afford to throw money around casually. It’s a dilemma. 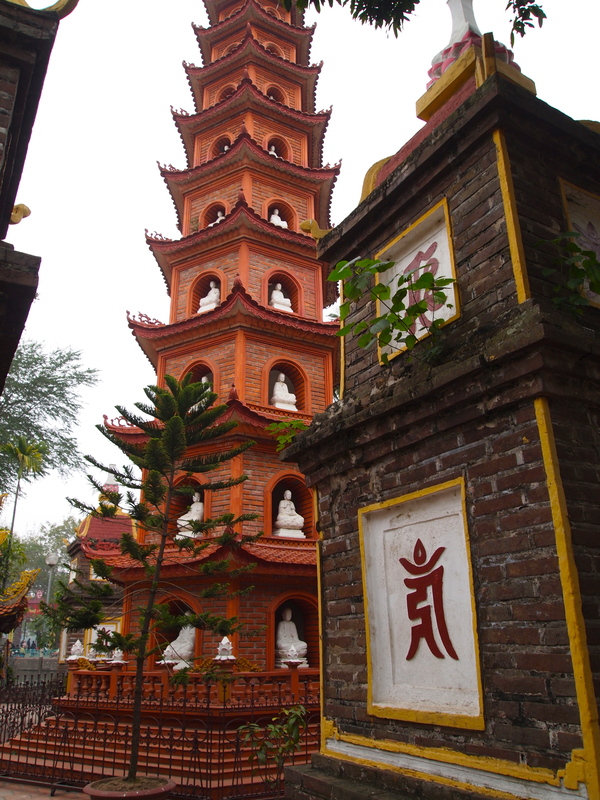 Tran Quoc Pagoda is the oldest pagoda in Vietnam and the cultural symbol of Vietnamese Buddhism. 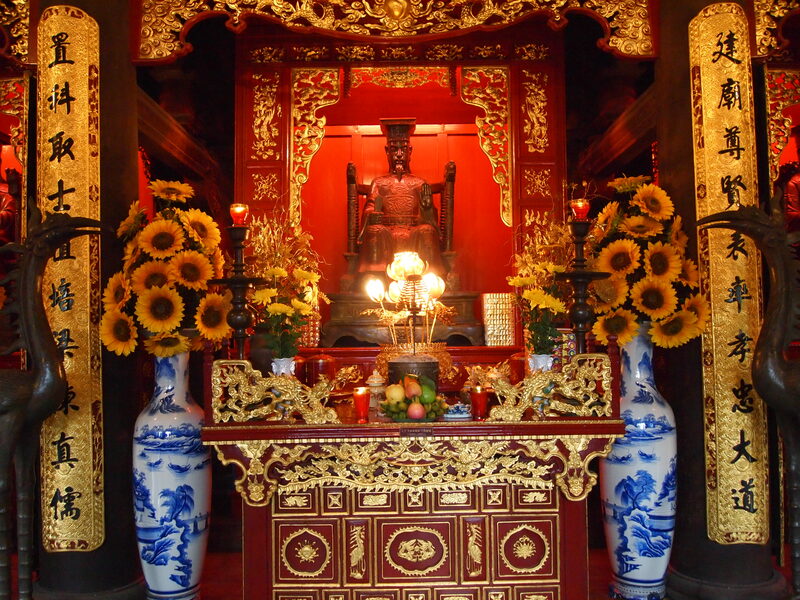 It holds beautiful Buddha statues in its many-layered niches. 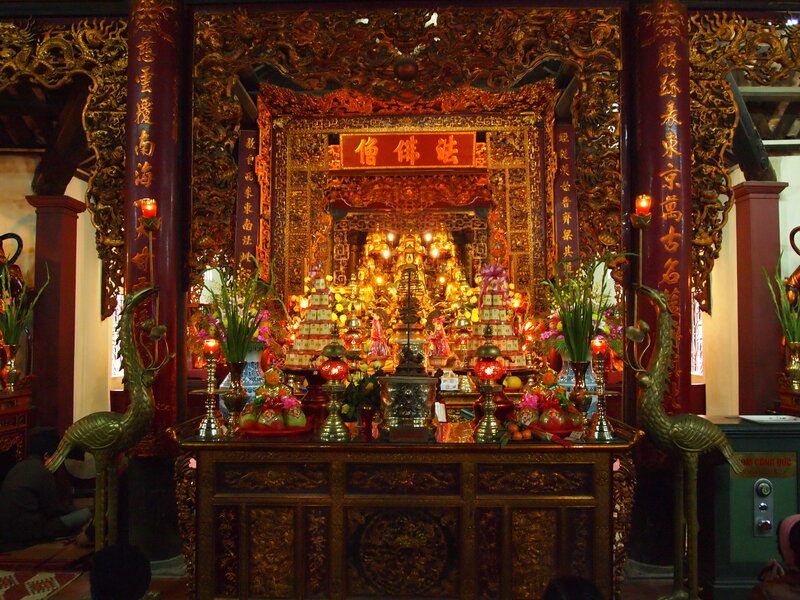 Luxuriant temples surround the complex; inside are more Buddhas enfolded in bountiful offerings. 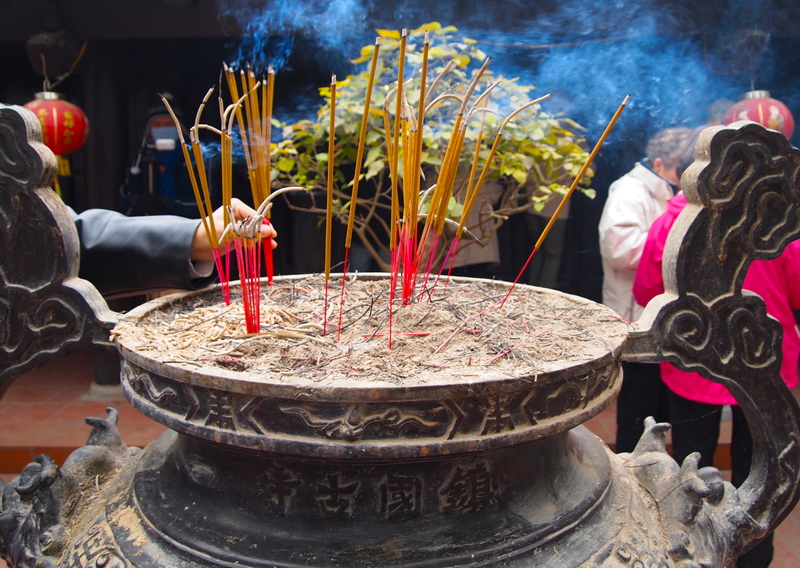 We light incense sticks in front of one temple and make wishes. 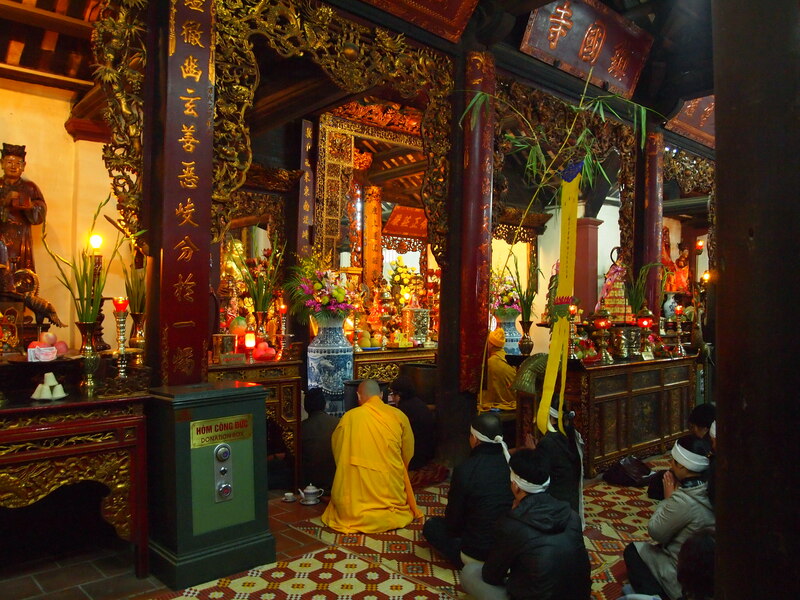 Inside, an orange-robed monk leads a worship service for about 20 devotees. 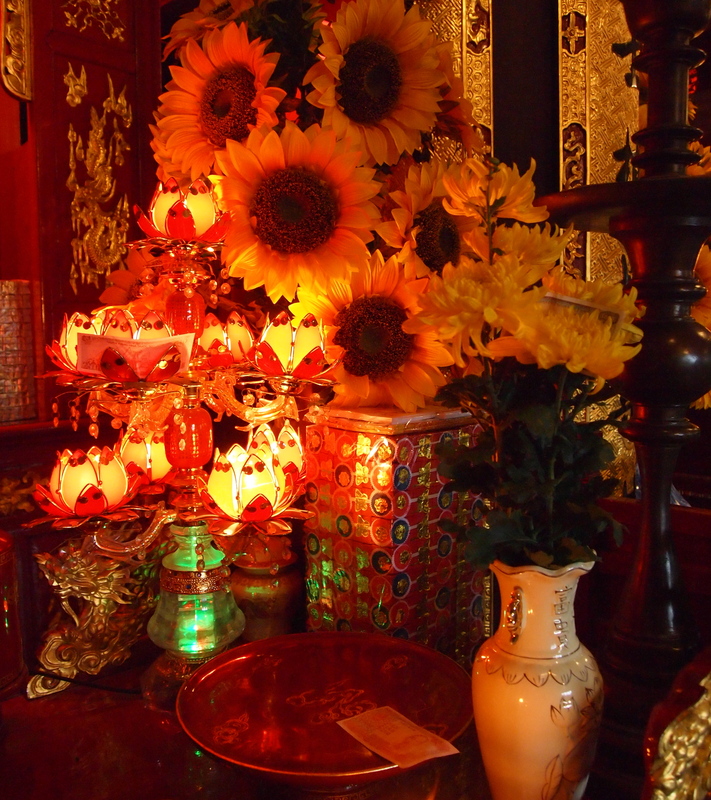 A temple full of energy and warmth, it’s quite unlike the cold empty temples I encounter in Korea. 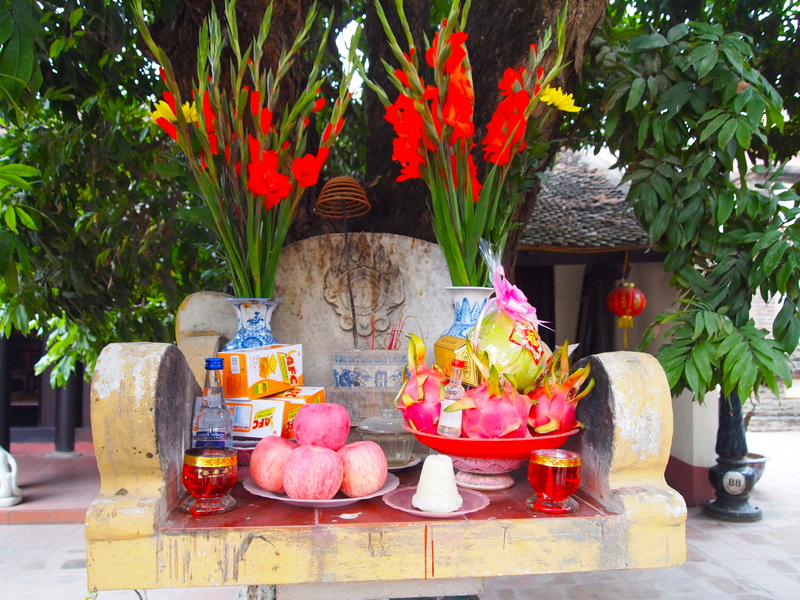 Tropical fruits, flowers, colorful Vietnamese dong surround the Buddha in abundance. Energy is here, positive energy. I like it very much. 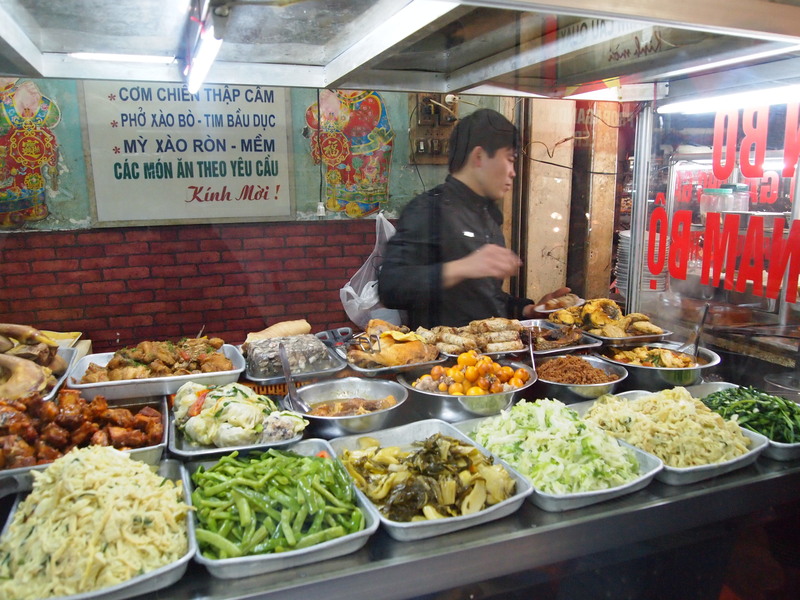 We head to the Ho Chi Minh complex and I am glued to the window. 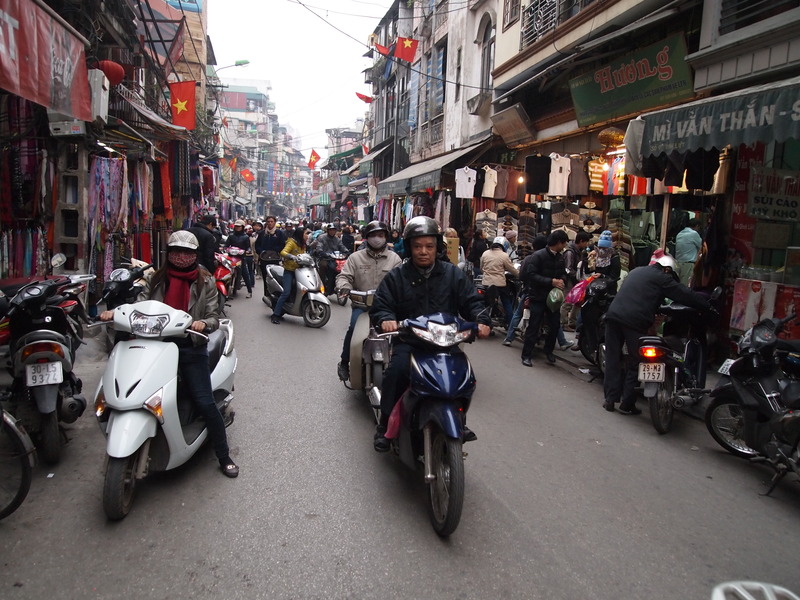 The Old Quarter is an extravaganza of motorbikes. Sometimes there is a single rider with a medical mask over his face. Sometimes whole families: father wearing a helmet, bareheaded mother and child, even a baby in the mother’s arms. 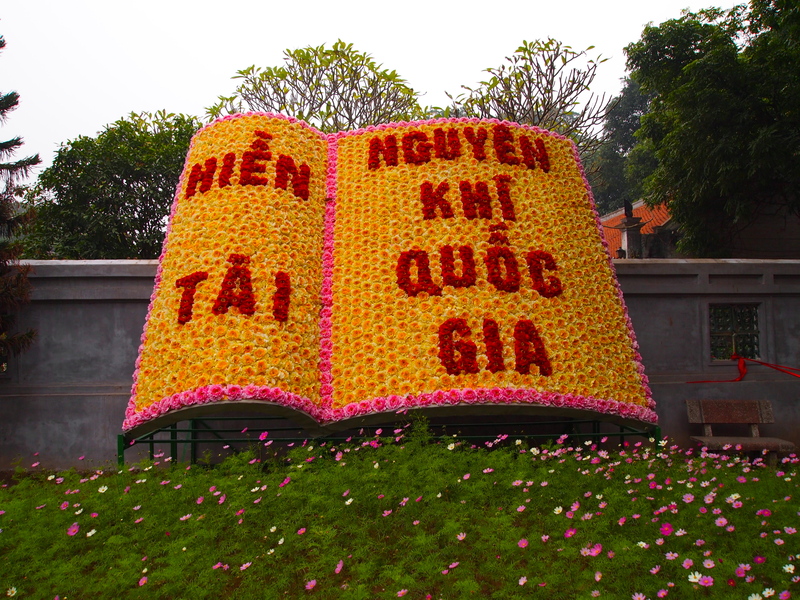 A motorbike with a huge flower bouquet, the stems whipping through the air high above the driver’s head. 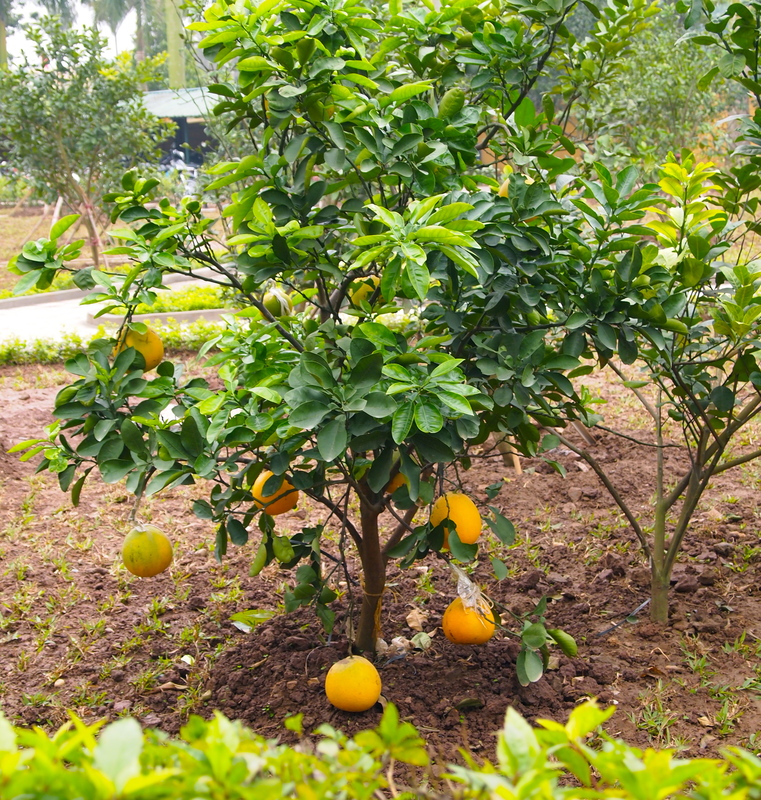 One with bundles of herbs, open to the elements. Piles of bananas. Stacks of plate-glass, egg cartons, firewood. 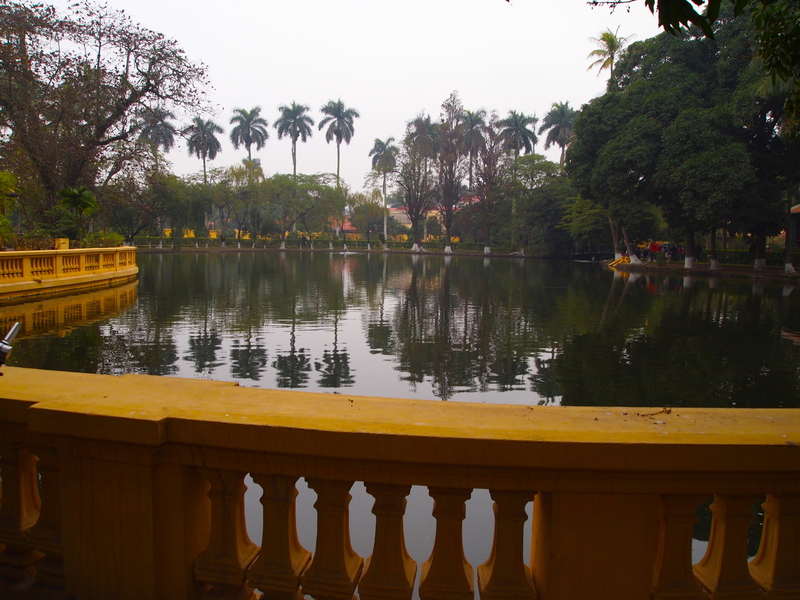 The French colonial architecture, evidence of a bygone age, lends a dilapidated elegance to the hazy city. Tall thin rectangular detached row-houses painted in chipped and faded yellow, terra-cotta, light blue, green. Balconies on the front facade. The sides of the homes are windowless unpainted concrete. Porches sag, trash is strewn everywhere. 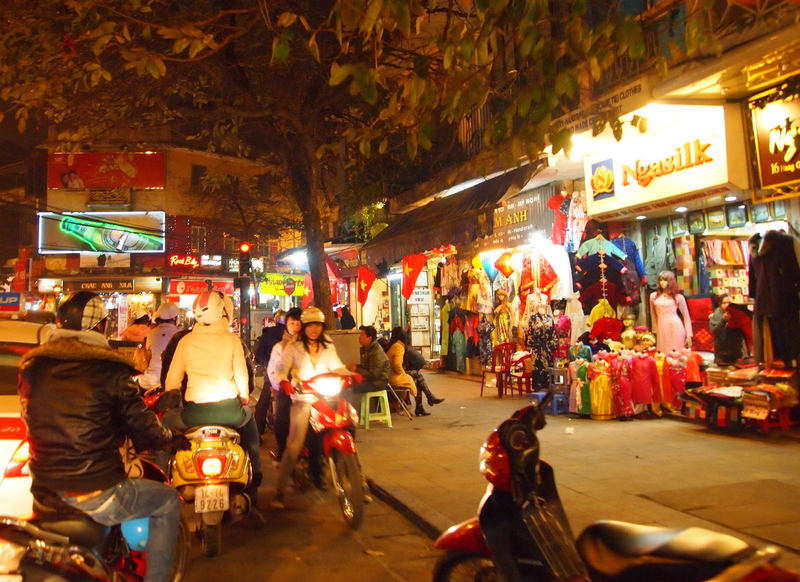 Commerce is ubiquitous, on every sidewalk, every street corner, every store front. 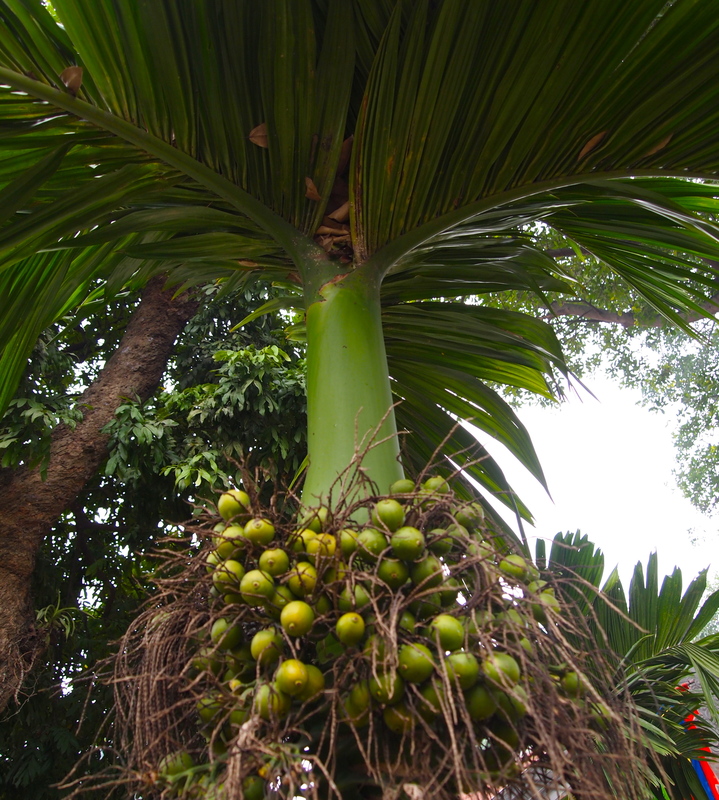 The smell of cilantro, limes, mangos lingers in the air, mingled with exhaust from cars and motorbikes. 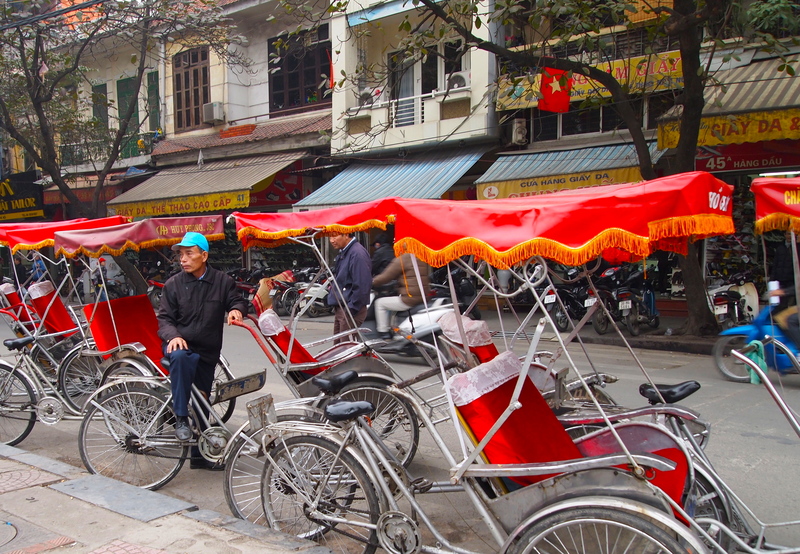 Cyclos roam the streets, somehow surviving the onslaught of the motorized vehicles that pack the street ten across. Pho (noodle soup stalls) are tucked into every crevice. Oversize people hunch on miniature plastic stools in front of low plastic tables savoring the street food prepared by cobbled-together food stalls. The energy here is infectious. 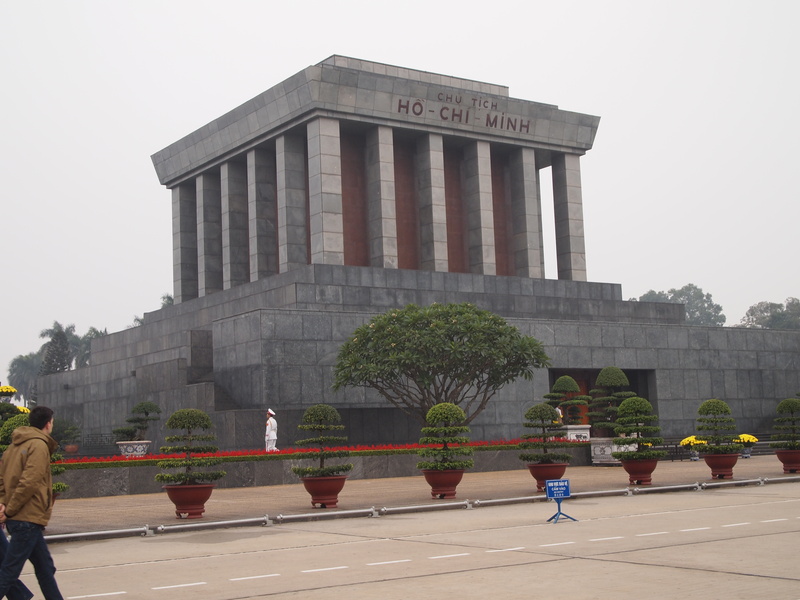 At the Ho Chi Minh complex we see the impressive mausoleum where the Vietnamese hero lies mummified within. However, it’s closed on Fridays for renovations so we miss out on viewing his body. 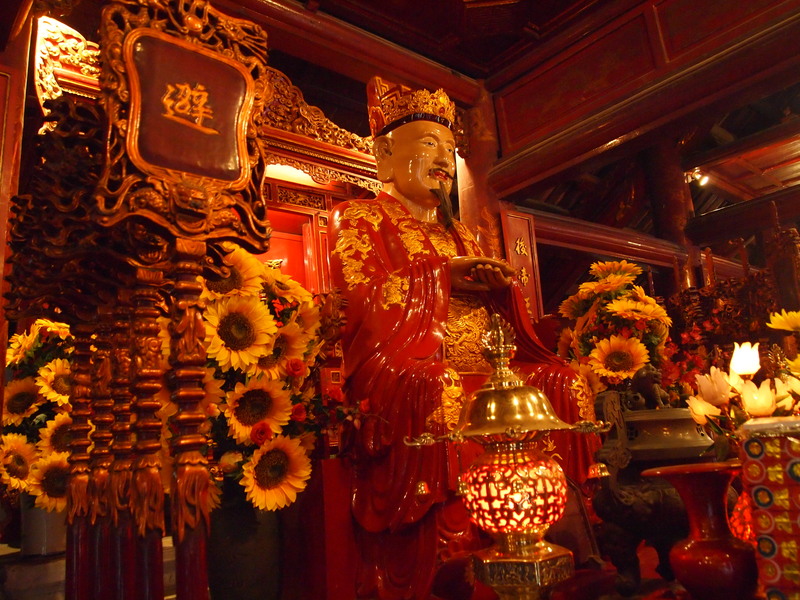 This was built despite his own wishes to be cremated and have his ashes scattered all over his country. 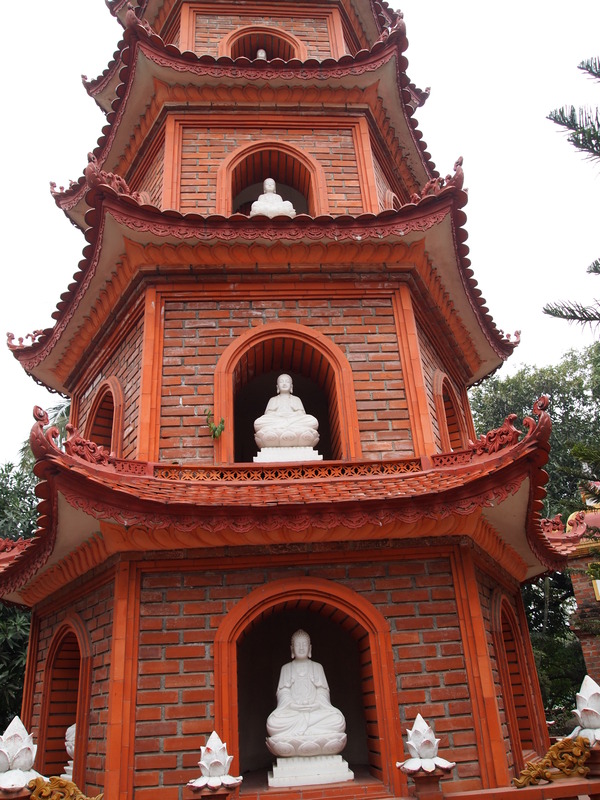 It was built from materials found all over Vietnam between 1973-1975. Every year his embalmed corpse gets a 3-month holiday to Russia for yearly maintenance. While walking in front of the complex, the Finnish be-sandaled guy asks if I’ve encountered any anti-Americanism since I’ve been here. 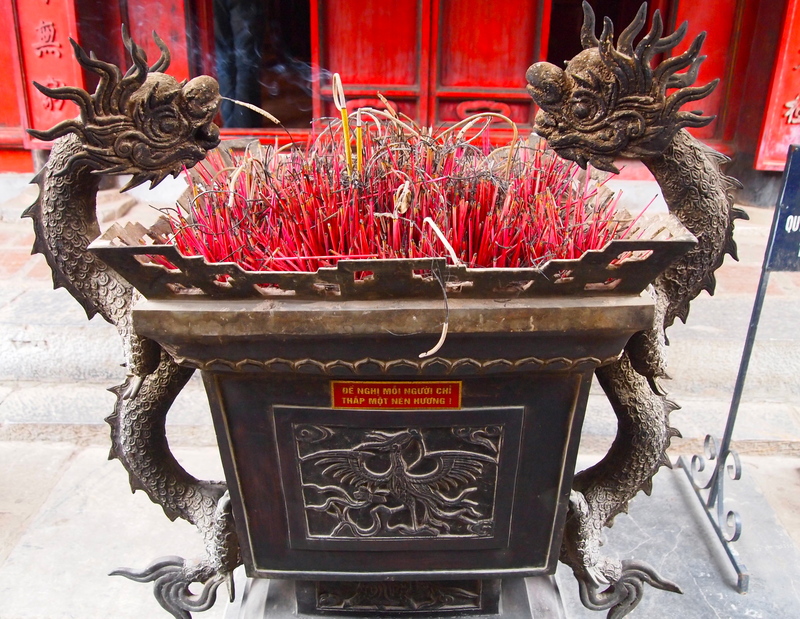 I say, no, people have told me that Vietnamese surprisingly don’t hold any grudges. He humphs and says, yeah, sure. I say, well, I don’t really know if they hold grudges or not. I can certainly understand if they do. He says, well, they won, didn’t they? Americans will never learn, will they? I say, you could say that about any country, looking at the long years of recorded history. And then I turn my back on him and pick up my pace, walk away. I am pissed!! It always seems non-Americans hold America up to a different standard than the rest of the world. They expect us somehow to be perfect and when we’re not, then we’re some kind of cursed demon. I encounter this kind of attitude often in my travels abroad. I wonder about his home country of Finland, whether it is different from most other countries, whether the Finns have “ever learned.” After it got independence from Russia in 1917, Finland fought civil wars and wars against the Soviet Union and Nazi Germany, but it stayed neutral during the Cold War. I guess Finland has “learned” though, as it is now ranked, with its 5 1/2 million population, as the 2nd most stable country in the world. 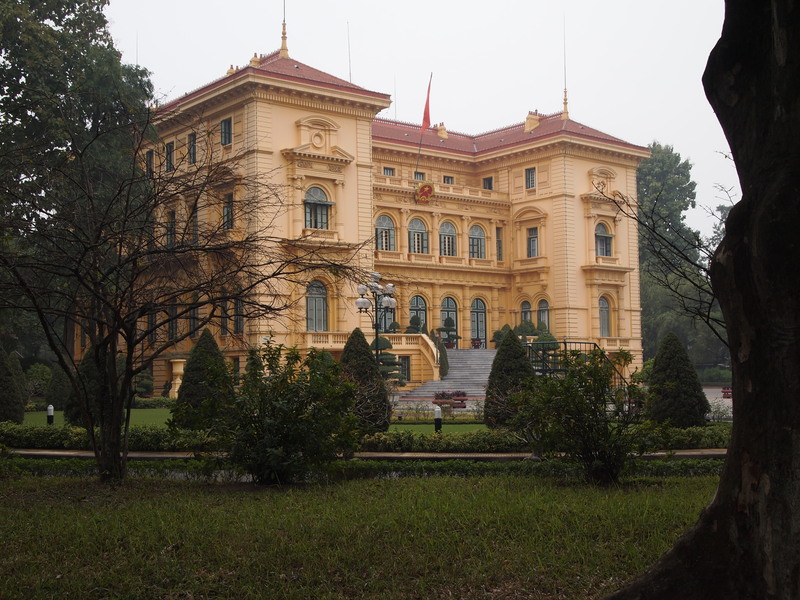 We walk around the grounds of the complex and see an updated version of the Presidential Palace, formerly used by the governor-general of Indochina and built in 1868. 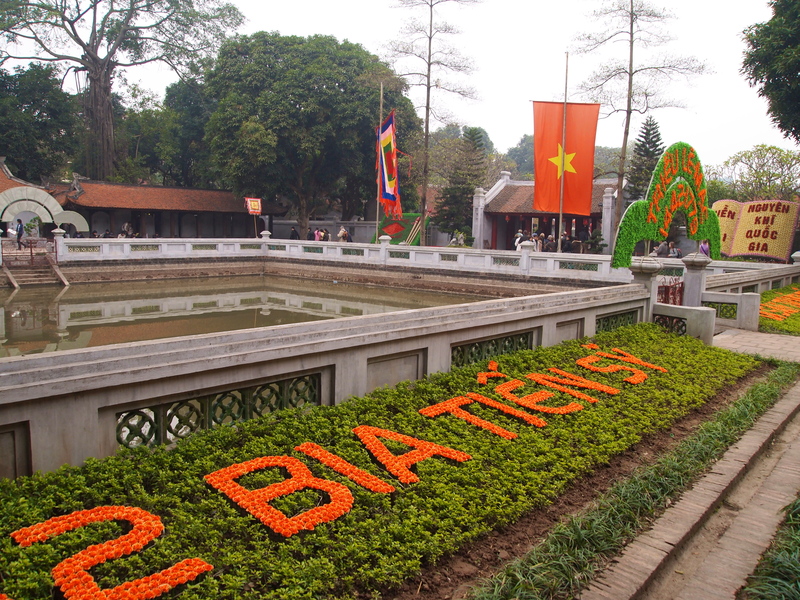 It later was the official residence of the South Vietnamese president Ngo Dinh Diem. 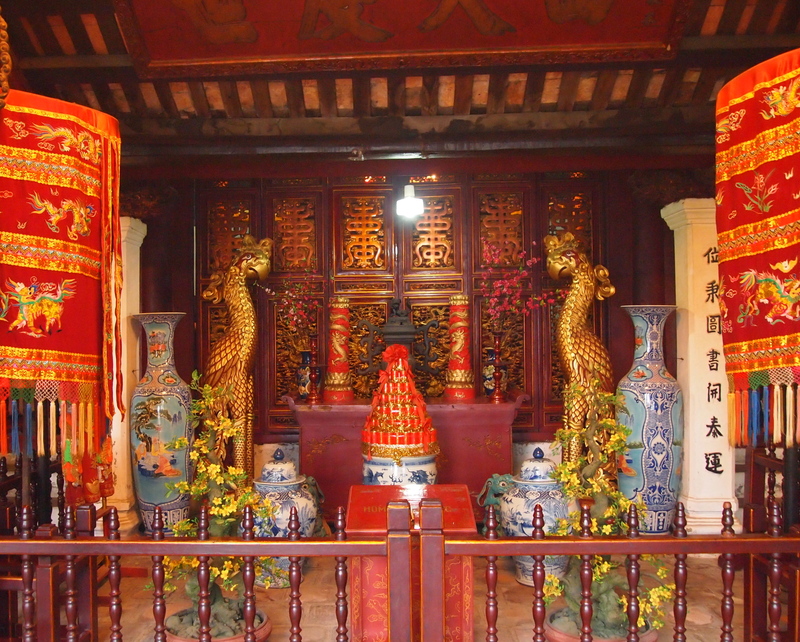 In February 1962 the palace was bombed by two South Vietnamese fighter planes in an attempt to assassinate President Diem. It was destroyed by the bombing even though the President wasn’t hurt. 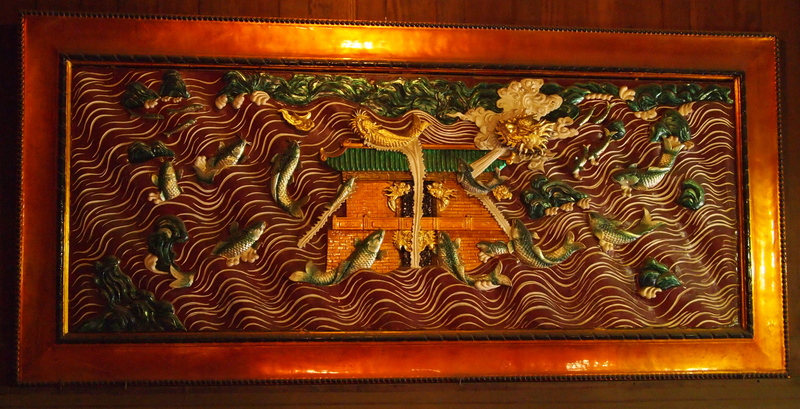 A new building was constructed called The Hall of Reunification. 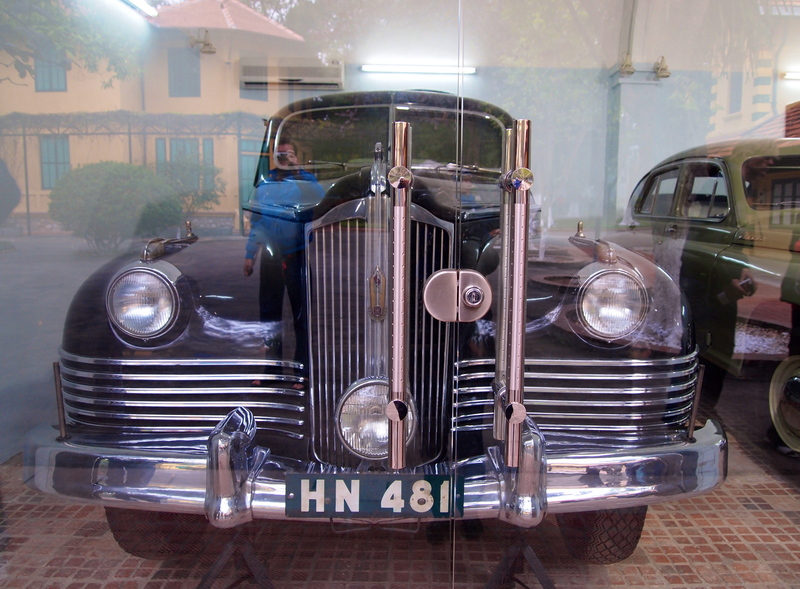 We see some of Ho Chi Minh’s collection of cars. 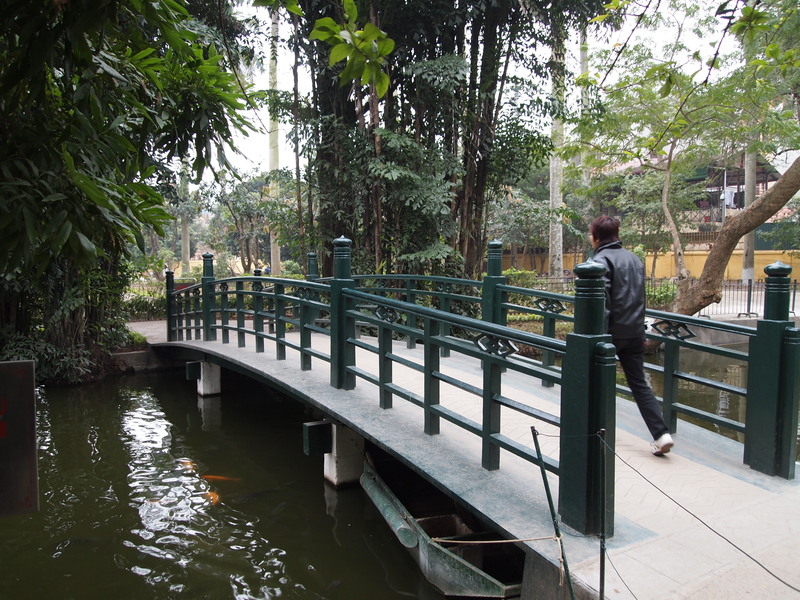 We then visit a beautiful carp pond where Thanh tells us you can bring the fish to the surface by clapping your hands, so everyone stands at the railing idiotically clapping hands over the pond. 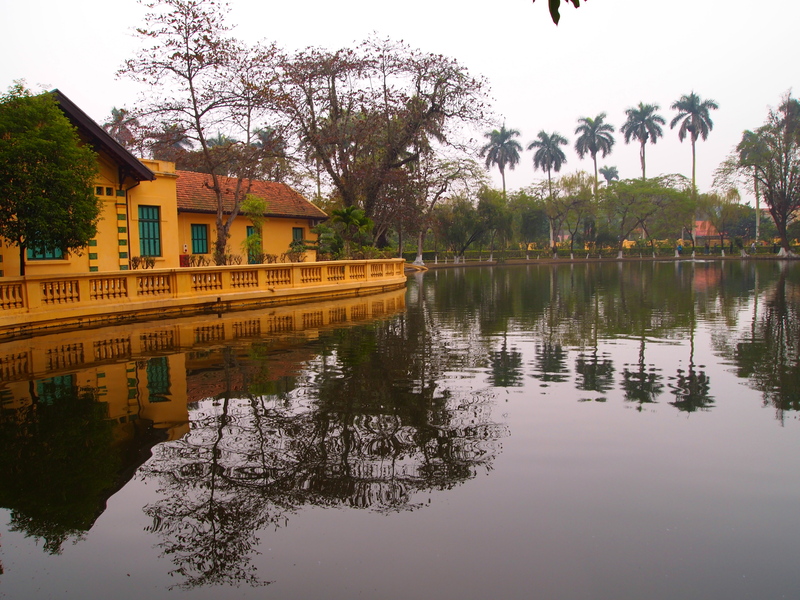 On the far side of the pond is the House on Stilts, where Ho Chi Minh lived and worked from 1958-1969, when he died. 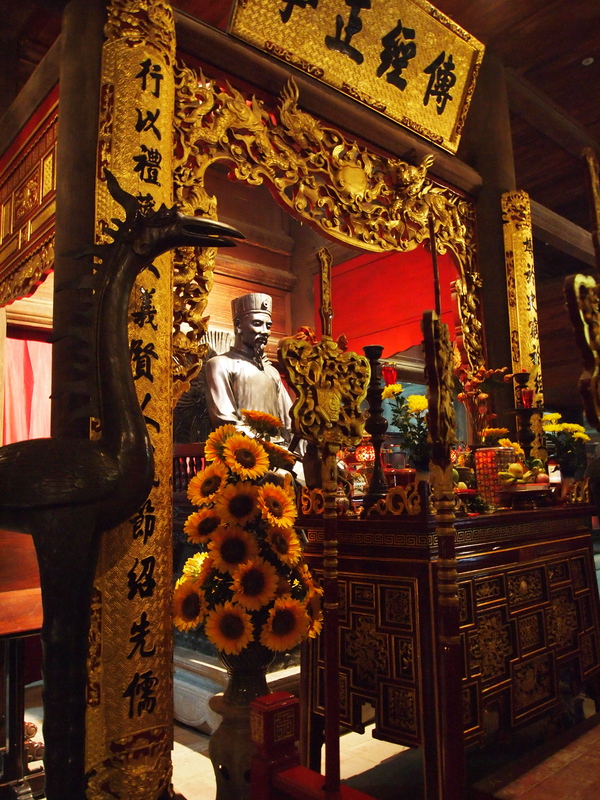 Built of lacquered and polished wood, it emphasizes the simplicity and modesty the revolutionary leader believed in ~ he wanted to be seen as a man of the people. 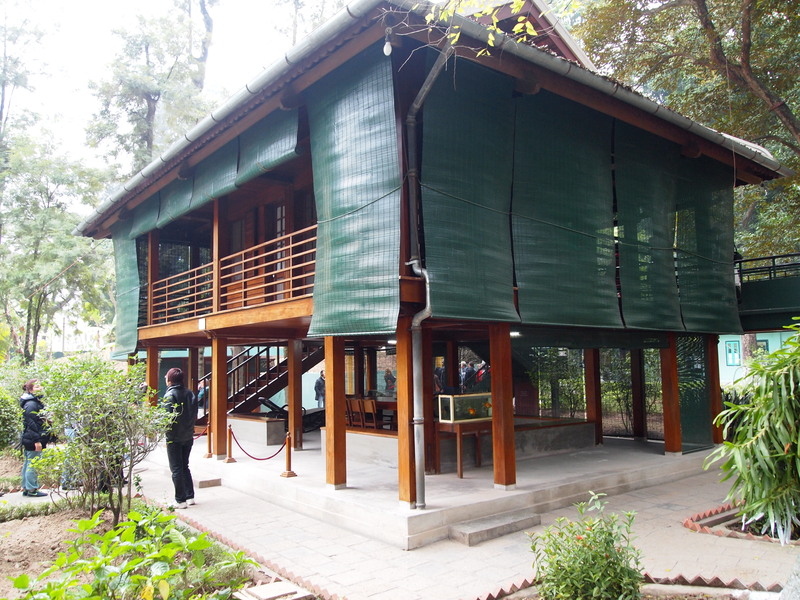 The house is modeled on a traditional communal house on stilts. 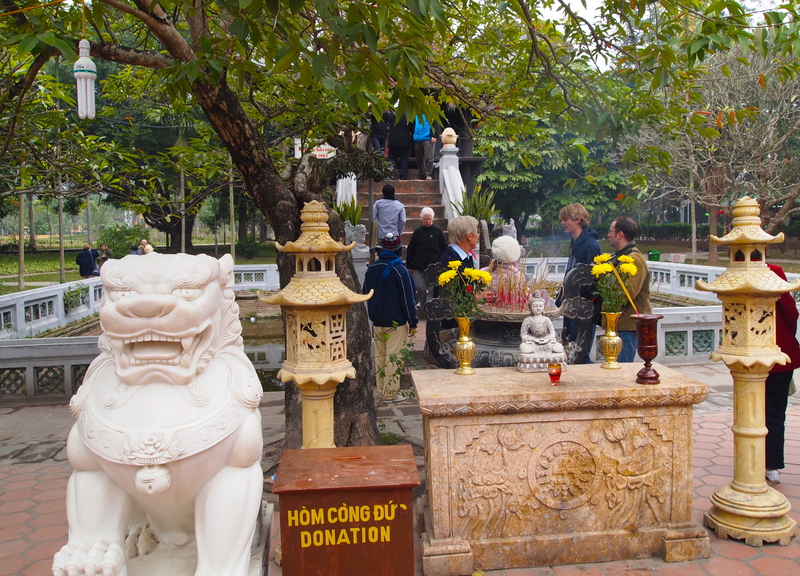 The setting is quite lovely, with the carp pond in front and gardens and greenery around. 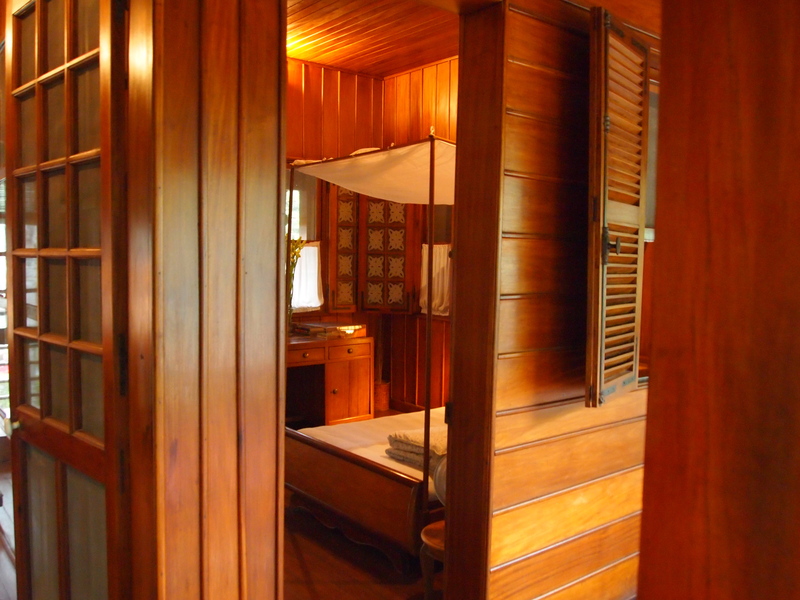 A tunnel leads from the dining room, which provided an escape route for Ho Chi Minh if his life was in danger. 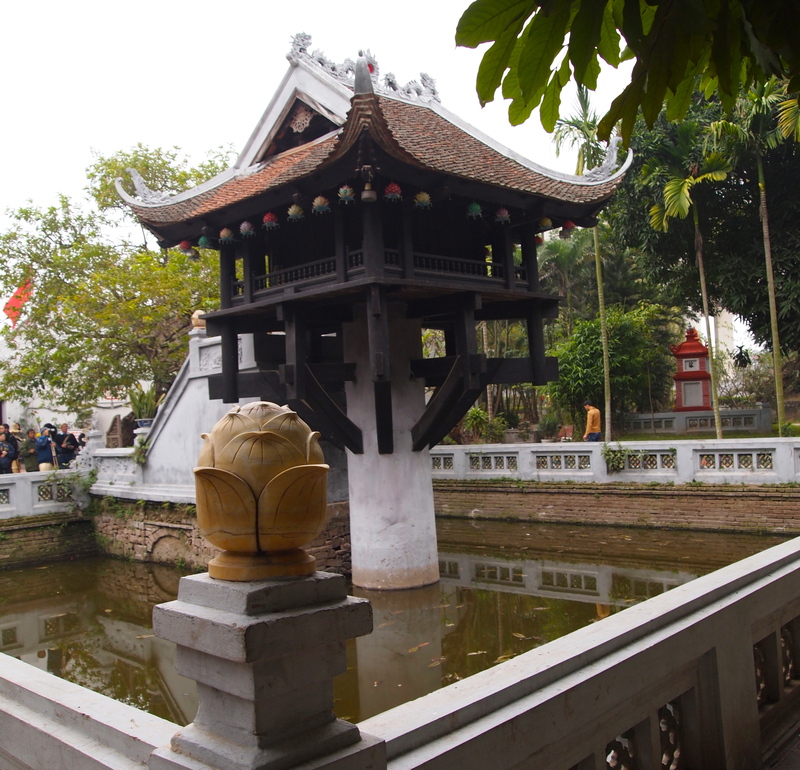 Next we see the One Pillar Pagoda, built by Emperor Ly Thai Tong (1028-54), designed to represent a lotus blossom, the symbol of purity, rising out of a sea of sorrow. 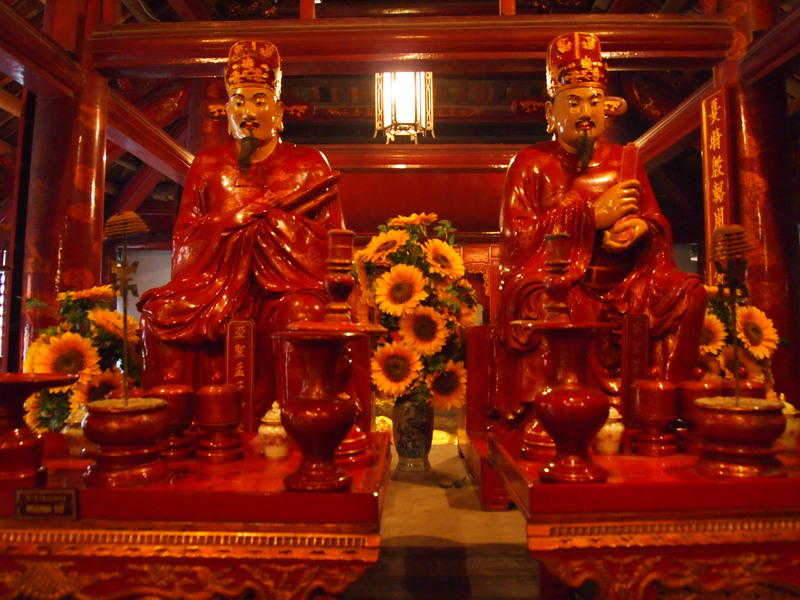 We visit the Temple of Literature, dedicated to Confucius in 1070 by Emperor Ly Thanh Tong and later established as a university for the education of mandarins. 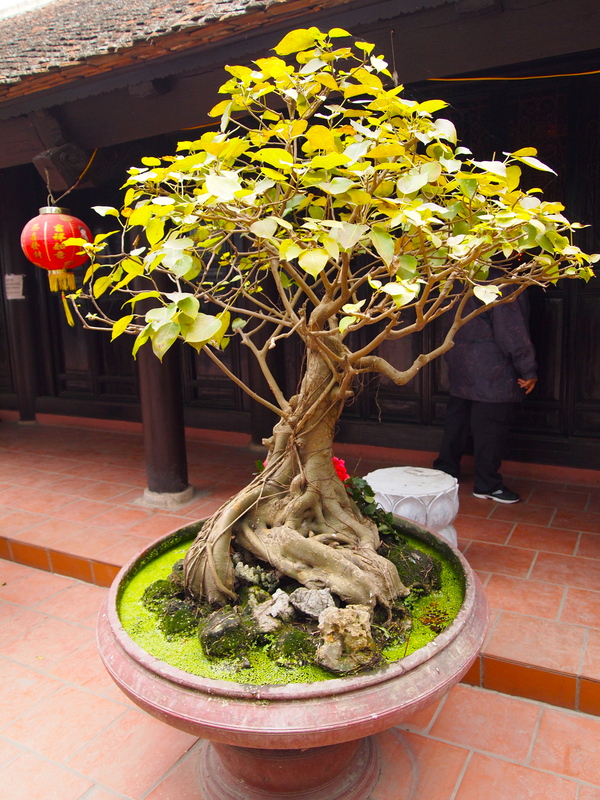 It has 5 courtyards, with a serene reflecting pool in the front courtyard, roofed gateways, and low-eaved buildings. 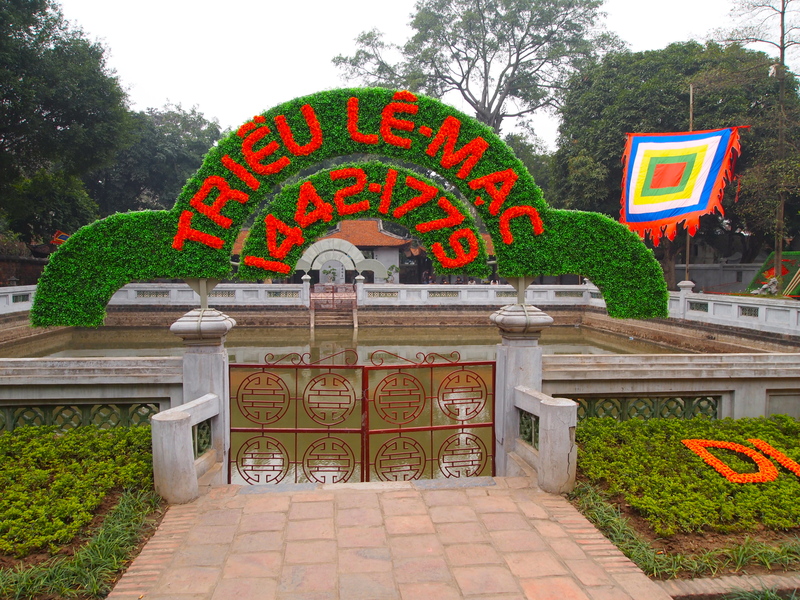 In 1484, Emperor Le Thang Tong ordered the establishment of stelae honoring men who received doctorates in triennial exams dating back to 1442. 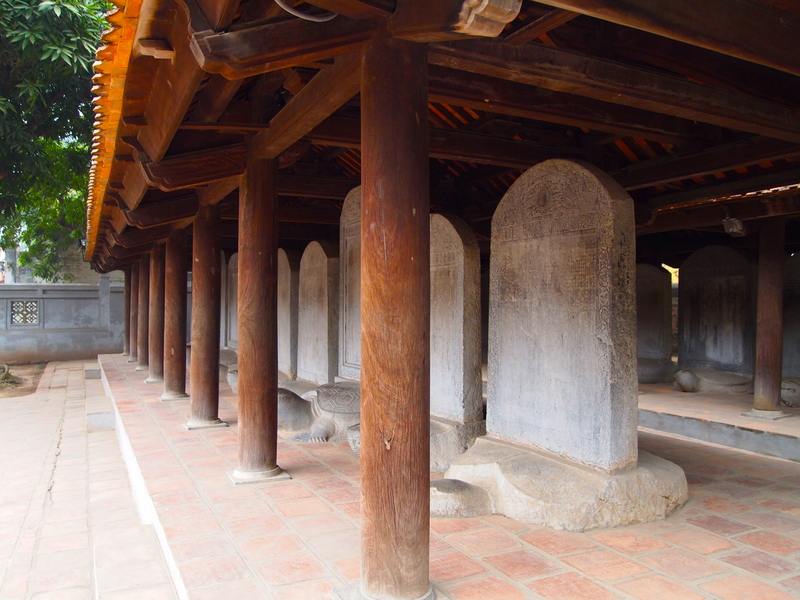 Each of these 82 stelae is set on a stone tortoise. 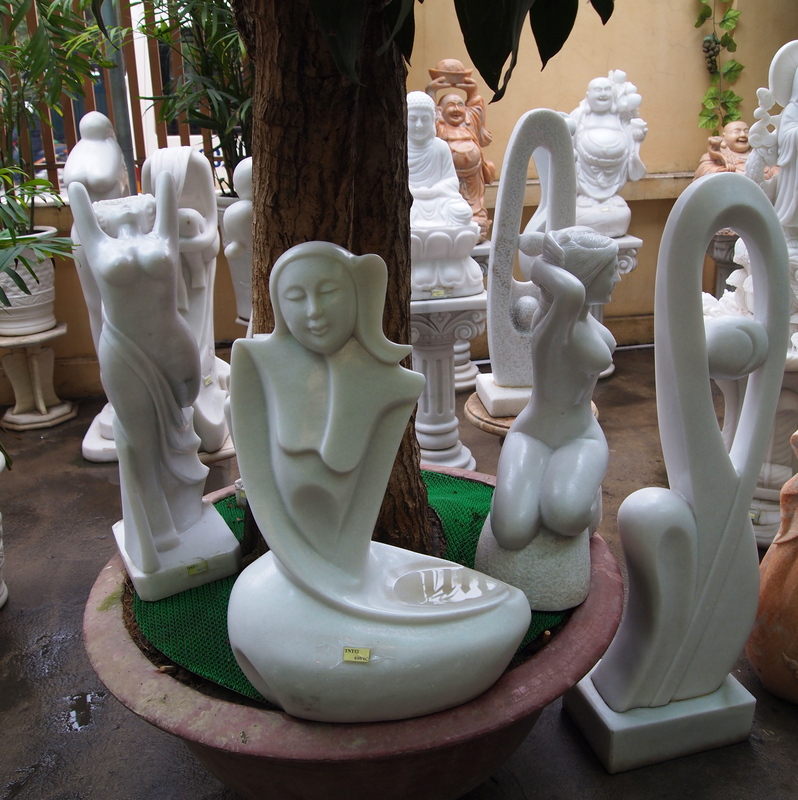 At a ceramics factory, Thanh asks if we’d like to try shaping clay on a pottery wheel. The Malaysian man in our group says, Cathy will do it! I say, why me? He says because you’re just the kind of person who WOULD do it! This comment pleases me immensely, but nonetheless I say, no, not me! I don’t like to get my hands dirty. 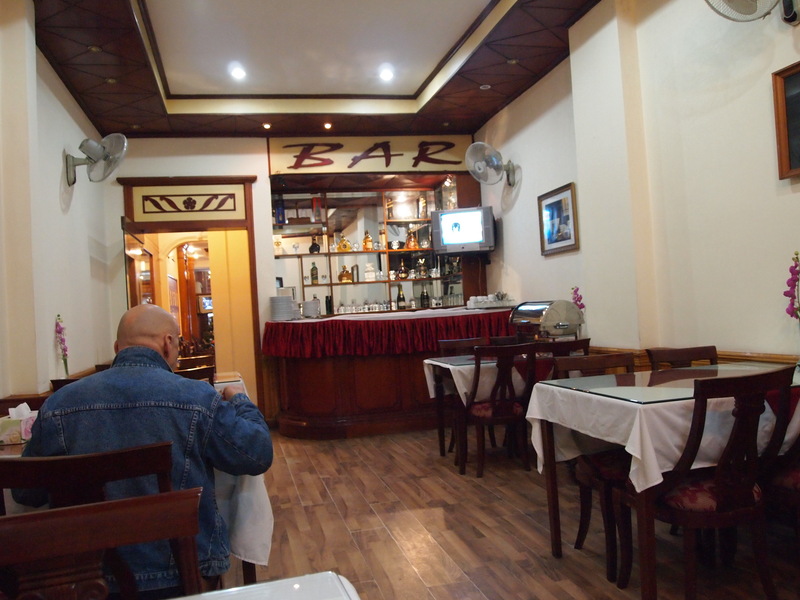 Lunch is a cold affair in a cramped restaurant, but we warm ourselves with Hanoi beer and mixed drinks. 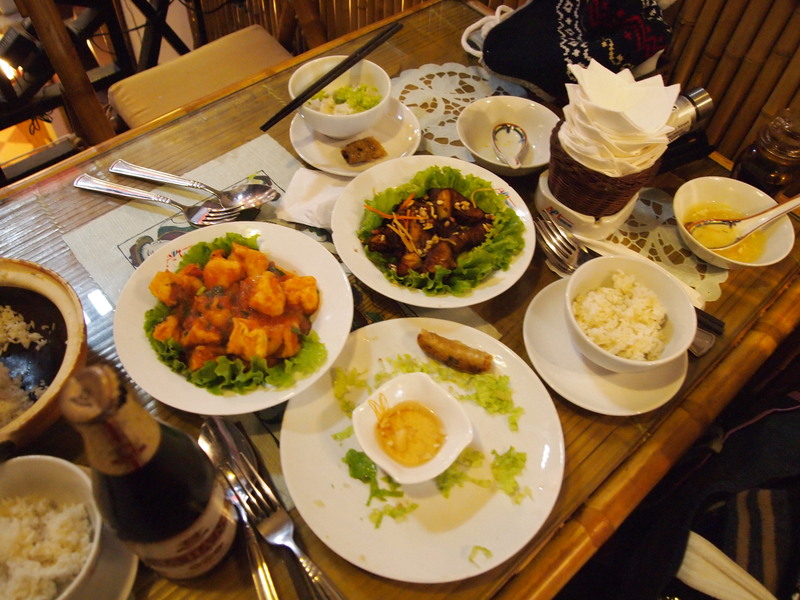 We eat spring rolls with peanut sauce, deep-fried eggplant, chicken…. 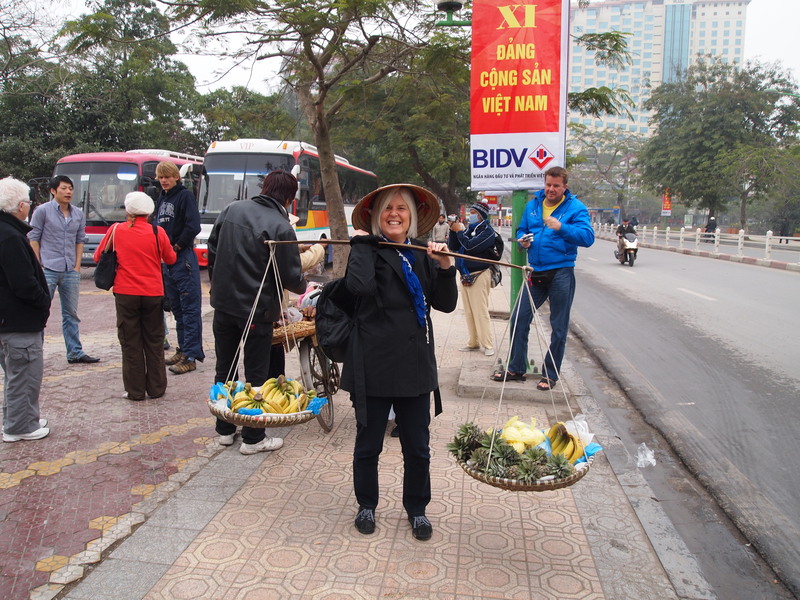 We’re cold but the food, in typical Vietnamese fashion, is wonderful. I sit with Roz and Sway and they tell me how they met. She was walking toward the bus stop. He walked past her and did a double-take, then he turned around and followed her onto the bus, despite the fact that she was grumpy and did nothing (so she says) to encourage him. After that she could never shake him! 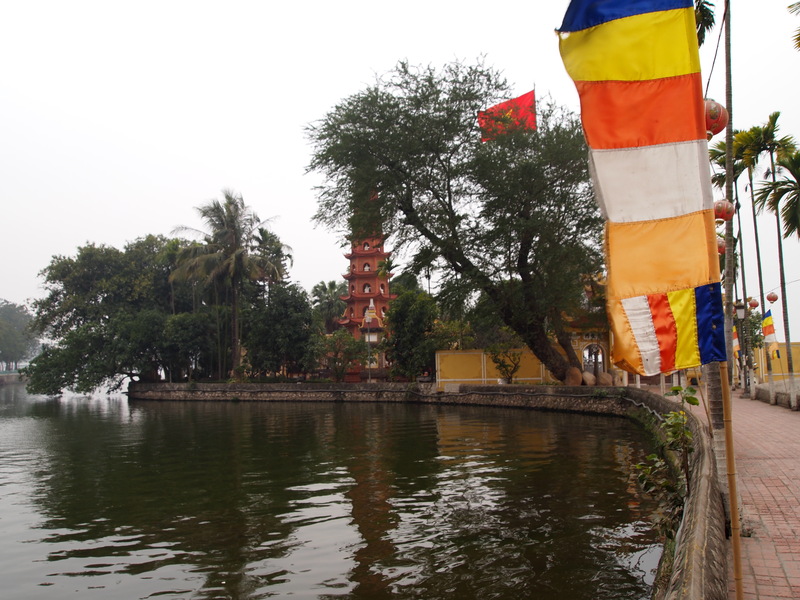 The end of our tour is at Hoan Kiem Lake, or Restored Sword Lake, with its Ngoc Son Temple. 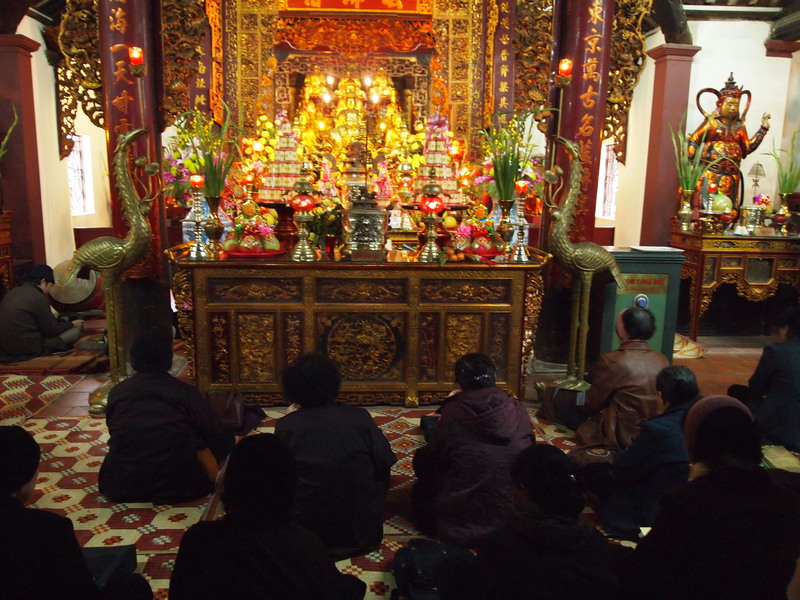 Once again the Buddhist temples are rich in color and offerings and energy. 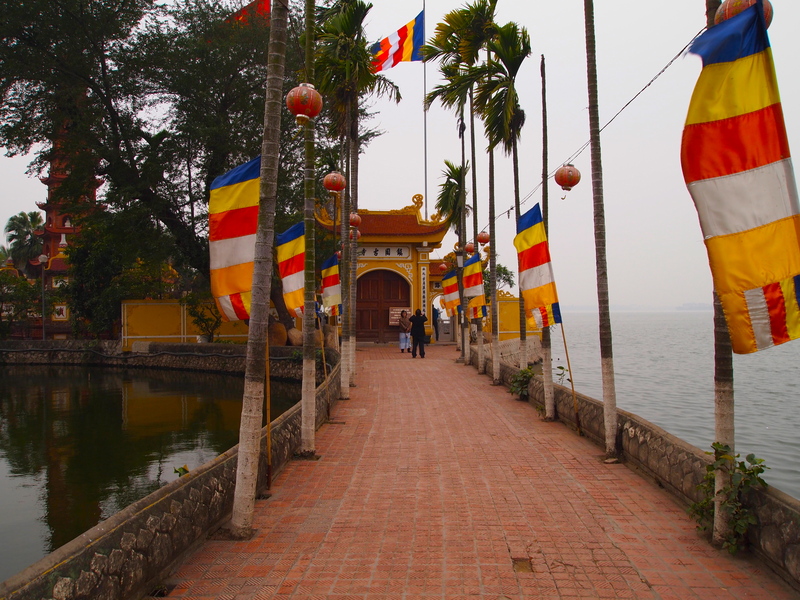 We also see young Vietnamese couples having their wedding pictures taken on the bridge on the lake leading to the temple. 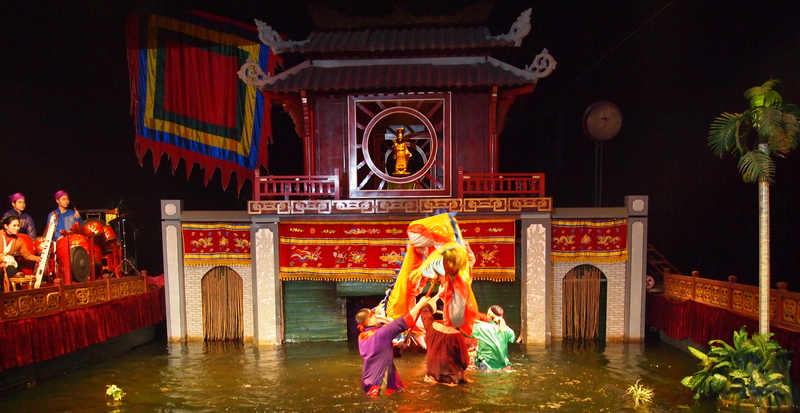 Some of us decide to go see the water puppet show. As it’s near the lake, we ask the tour guide to drop us off there. We negotiate the crazy traffic as we attempt to get to our destination. 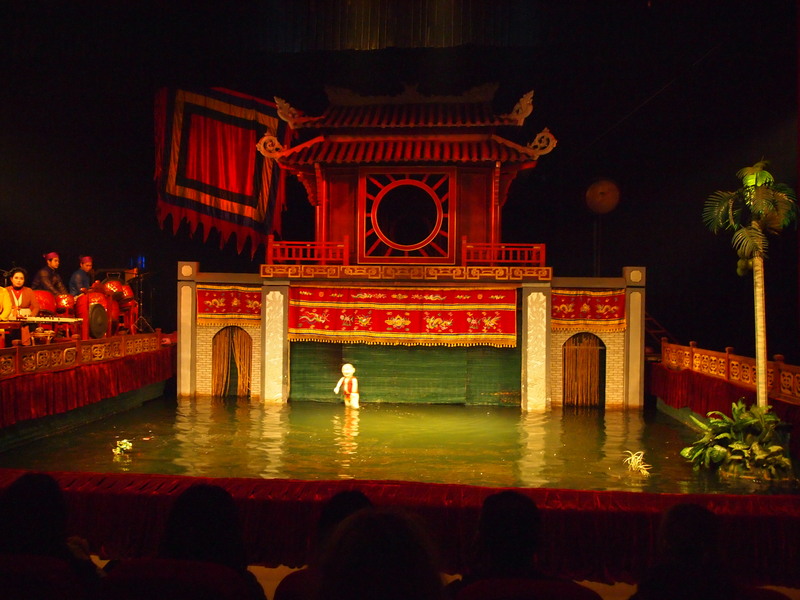 Later, walking up the stairs at the Thang Long Water Puppet Theater, the Finnish guy puts his arm around Miss Korea, but later, as we sit in the theater, she and Roz do some seat switching as she has no interest in the Finnish guy, who has become quite proprietary with her. 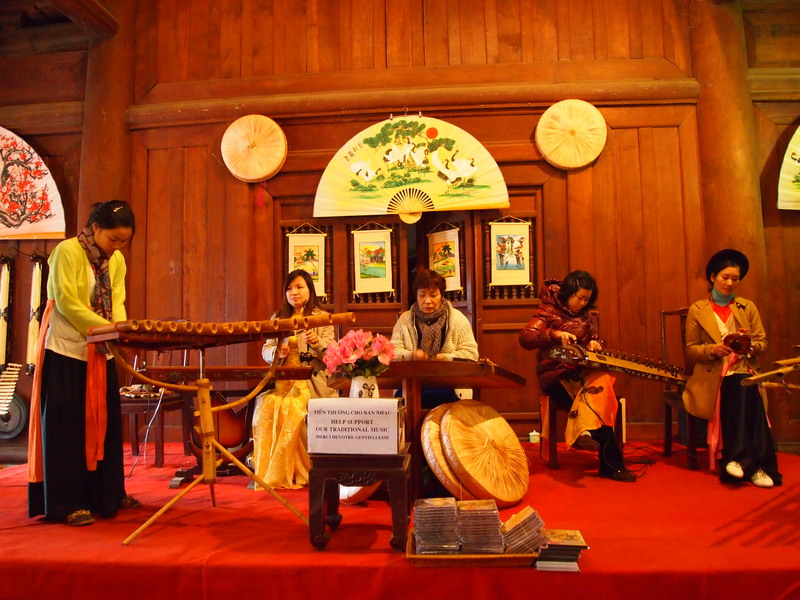 The show is quite cute, although it’s all in Vietnamese. The little puppets are doing all kinds of silly actions & acrobatics and we can’t help but laugh even though we don’t know the story. After the show, I decide I will leave the group since there are two couples here and I am the third wheel. When I walk out of the bathroom, the Korean woman is having a serious talk with the Finnish guy, probably telling him she still hasn’t recovered from her recent relationship and so isn’t ready for any kind of friendship with him. I go directly to a nondescript restaurant that has a glass case showing delectable treats. I order shrimp with broccoli and noodles. 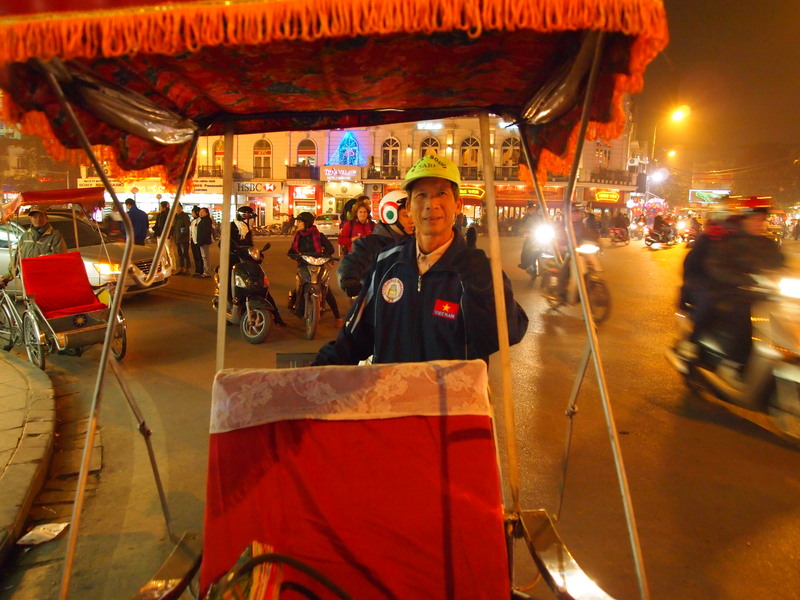 After dinner, I take a cyclo back to my hotel, and though I’ve agreed to give the driver $3, he doggedly suggests, as he pedals along, an hour tour of Hanoi for $5. When I say I don’t want to spend an hour, he suggests a half-hour tour for $5. Funny, when someone doesn’t want to buy something, don’t you come DOWN on your price? I end up giving him $5 at the hotel anyway… again, it’s that feeling sorry for people and feeling guilty for giving them so little for their efforts. Back at the hotel, I am checking my emails on the lobby computer, since I didn’t bring one along, and it is exceedingly slow. I have hundreds of emails, mostly junk of course, and it’s taking me forever to sort them out. 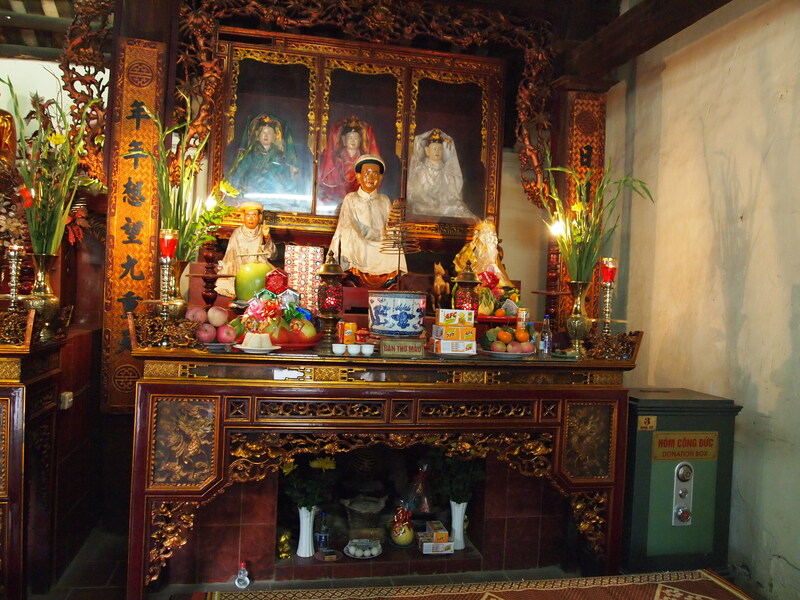 In addition, I find that Facebook is blocked in Vietnam, as it is in China. 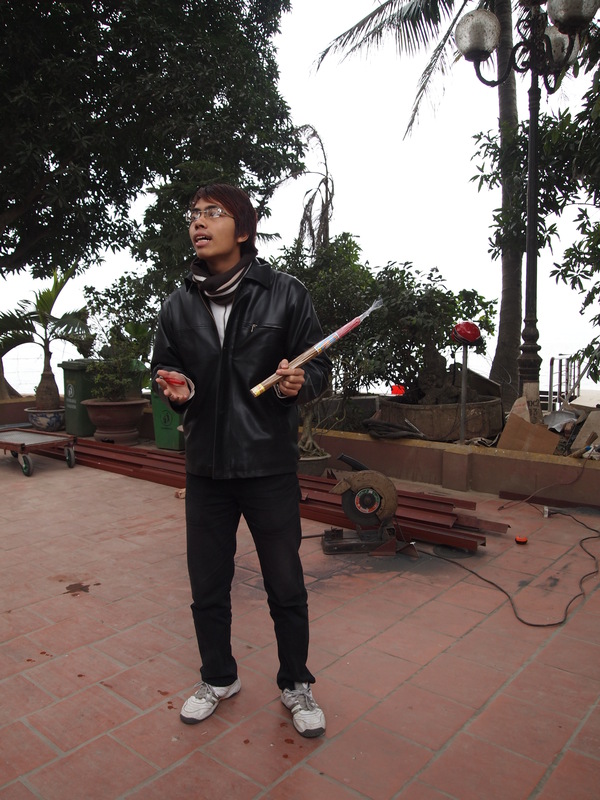 Later, I find out from Ken on the Halong Bay cruise that you can get past the block by using www.lisp4.facebook.com. At the time I don’t know this, so I spend wasted efforts trying to log in to answer some messages from friends. Meanwhile, a Vietnamese guy visiting from Ho Chi Minh City pulls up a chair next to me and starts yapping, asking me all about myself. I get irritated and try to ignore him, because I’m tired and trying to concentrate on my emails but he won’t let me be. When he sees I’m ignoring him, he disappears, but then he comes back and asks if I’d like to go out into the city with him. I say, to do what? 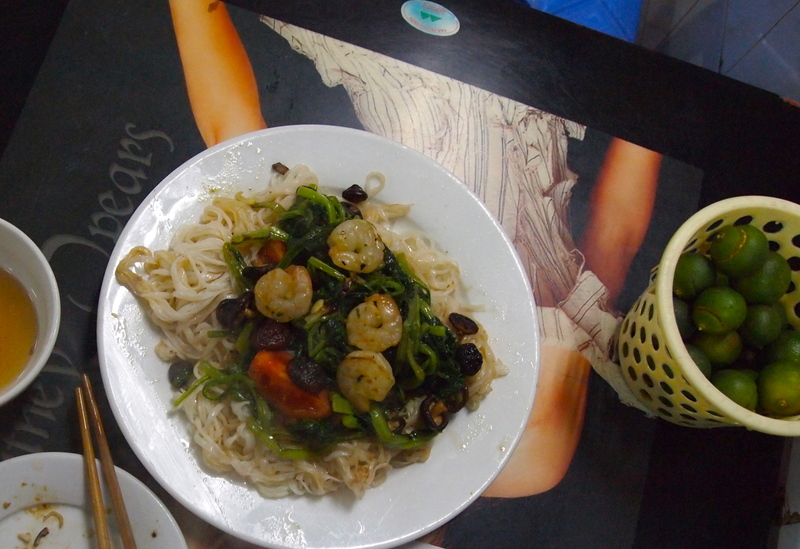 He says he wants to give me the Vietnamese-Hanoi experience. I say, doing what? He says we can have dinner but I say I’ve already eaten and I’m really tired, so no, I can’t go. He seems disappointed. Usually I am up for some kind of adventure, but tonight I’m tired from trying to ward off the cold all day, from an activity-packed day, and from my horrendous travel day yesterday. I go to my room, where luckily the heat is now working, and take a long warm bath and watch a ridiculous movie on TV with absolutely no plot. 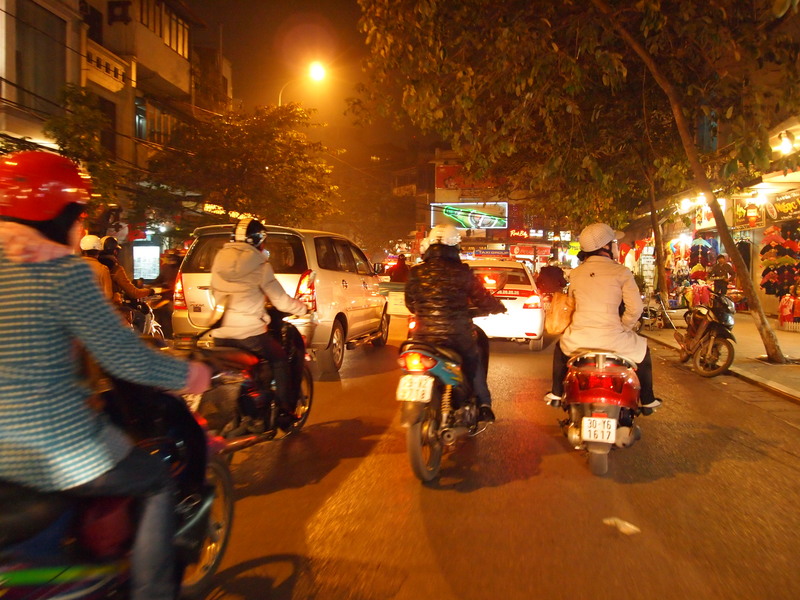 I fall asleep before the end, loving Hanoi, its craziness, its chaos & energy, its cilantro- & lime-flavored food, its sing-song whining language, its rich colors, its French-ness. 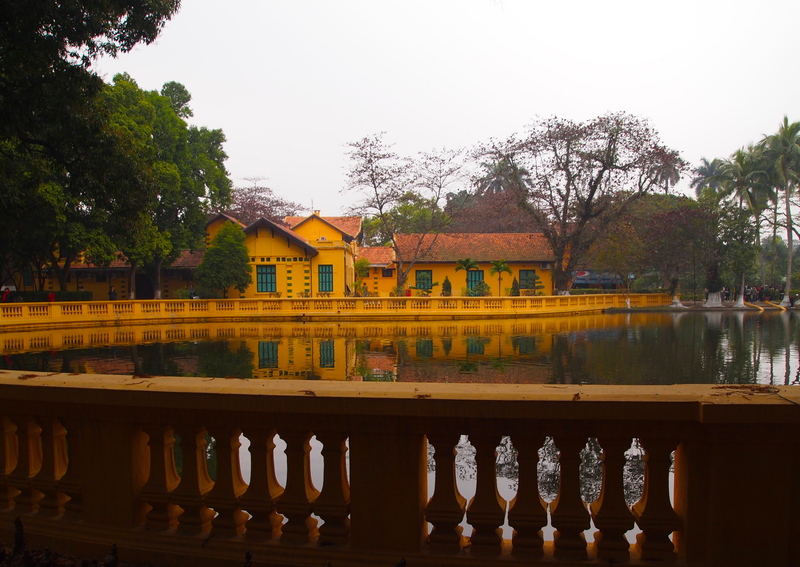 Loving Hanoi.